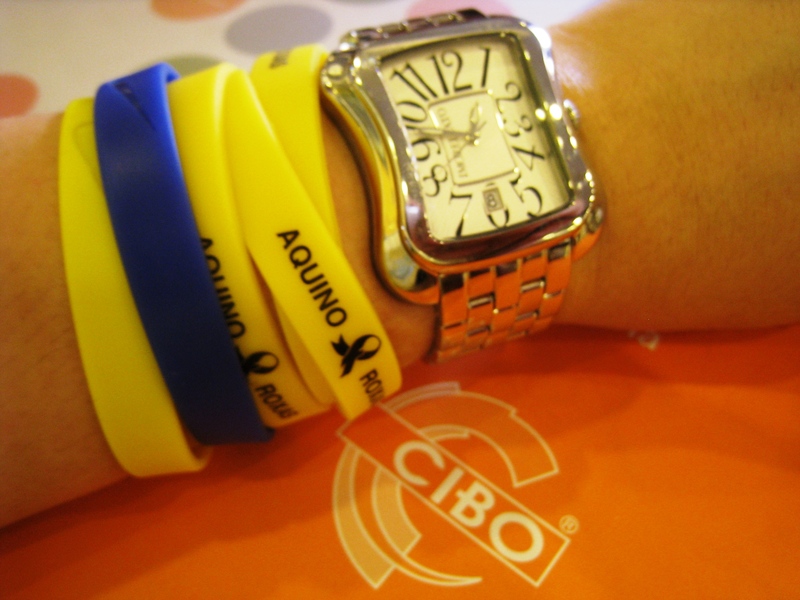 CIBO IS one of the few restaurants which I feel I know like the palm of my hand. Politely, I’d always fight the urge to shoo away with a subtle hand gesture and a slight tilt of the head their menu that could be, to the uninitiated, unimpressive with its thinness, but in a split second overwhelming with its voluminous contents. And lest I forget, the pictures are quite pretty. 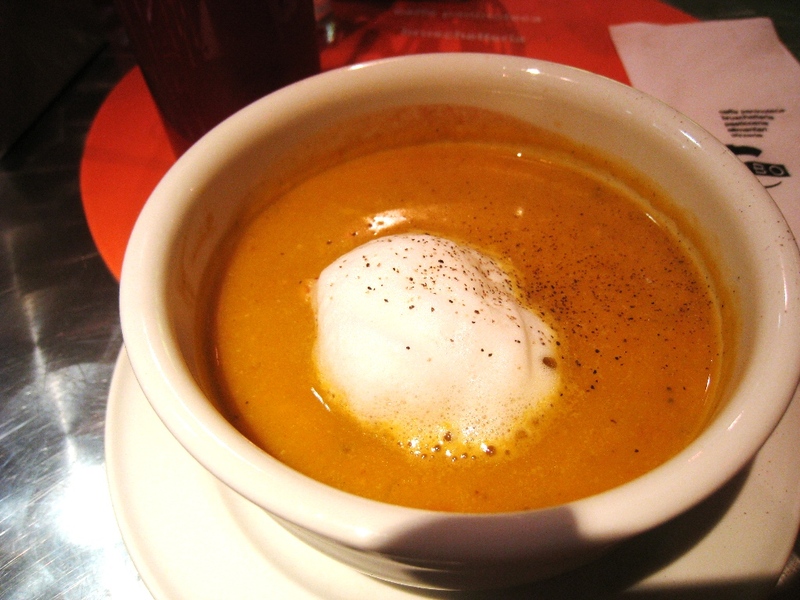 My Cibo usuals are their Zuppe Crema di Zucca (butternut squash soup), Spaghettini Alla Romana, Farfalle Alla Genovese, Succo di Pomodoro (tomato juice), and Panna Cotta Cioccolato (cooked cream with chocolate sauce). On this dinner with Partner and The Boy Wonder, I had the sudden inspiration to veer away from my usuals. Though not one to be at a loss when assaulted by visuals – text and photos – I suddenly found myself stumped as to which to choose from the extensive menu. As it is with really great restaurants, the wait staff could be trusted to be more than just cordial, uniformed personnel who dish out entrées. I turned around to look our server in the eye and asked him point-blank, “Which is your favorite? On the menu… which is it?” I half-expected my change of gears to throw him off, unable to organize a well-thought-out response. It felt so good to be able to carry on a sensible conversation with an obviously knowledgeable service crew that I found myself expressing this delight by mouthing a line from one of the songs of Forbes Magazine’s most powerful celebrity this year. “K-k-kinda busy…” I remember Partner and I snapping our fingers. Before I even laid eyes on my spaghettini al telefono, I was made aware of its proximity by the whiff of fragrant basil that perfumed the air around me. 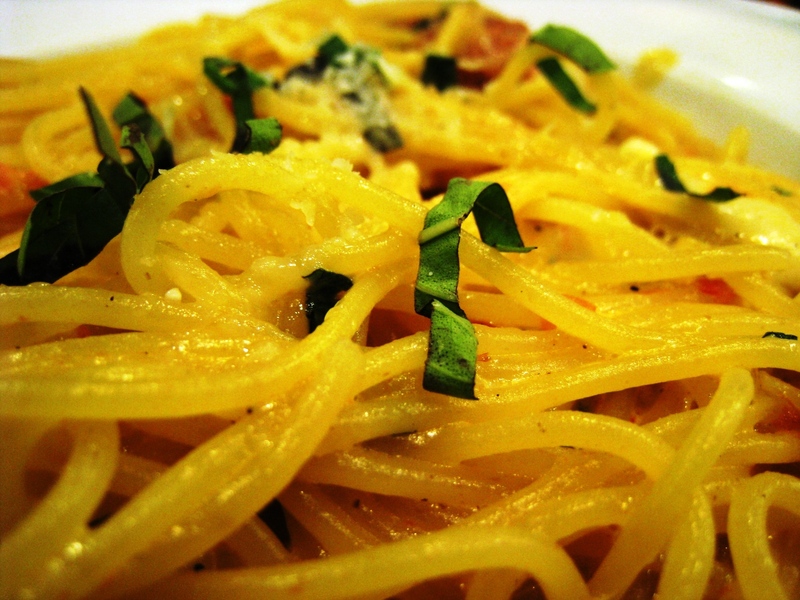 “Your spaghettini al telefono,” Jose politely declared as if announcing the advent of pasta that would change my life. 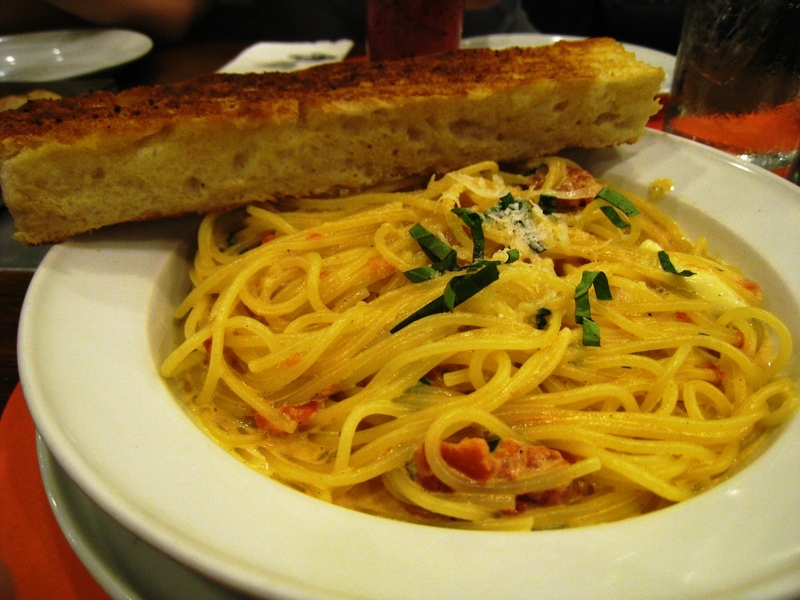 The generous single-serve portion was ensconced on a pristine white bowl, the spaghettini’s creamy paleness beautifully setting off the confetti of julienned basil on top. 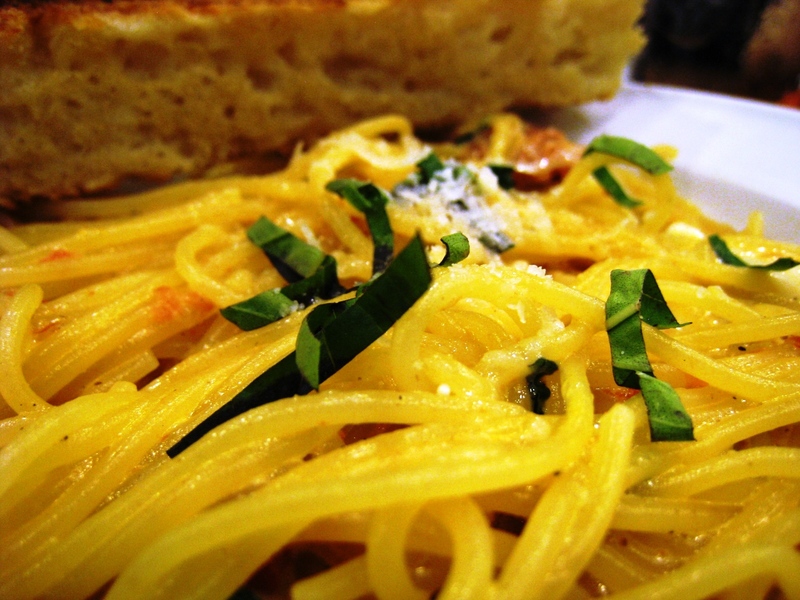 A confetti of julienned basil perfumes this pasta! I stuck my fork through the mound of al dente pasta, twirled until just enough spaghettini, cheese, and shards of stewed tomatoes had clung to the tines. I lifted my fork and noticed the string of cheese that dropped down from the pasta as if reclaiming its rightful place back on the plate and away from my mouth. “Oh, just like telephone lines.” I guess I’d figured out the dish’s name’s provenance before even feeling the need to ask around. Cibo’s “al telefono” is creamy without being so rich – the creaminess of the sauce resembling the thin consistency of heavy cream against the solidified horror that is the commercially available “all-purpose cream.” The stewed tomatoes, already on its own infused with the goodness of Italian herbs and aromatics, provide the perfect foil to the stringy mozzarella and white cheese. I couldn’t help but compliment Jose on his recommendation. It is now my new favorite on their menu! My new favorite at Cibo! Downed a couple of these!!! My Cibo usual, Succo Di Pomodoro (tomato juice), instead of the usual couple of cracks of the pepper mill, Jose proposed to rim the glass with salt and pepper. DELICIOUS! 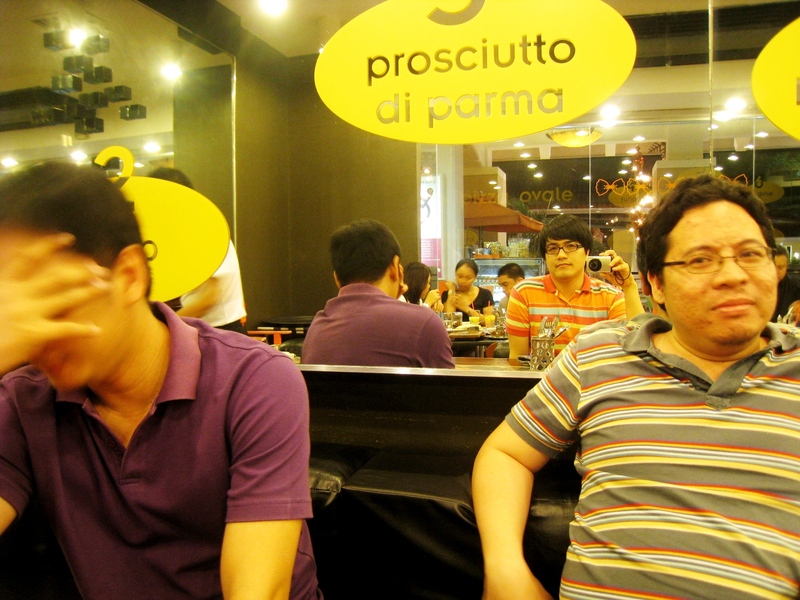 That's Jose of Cibo at Alabang Town Center. 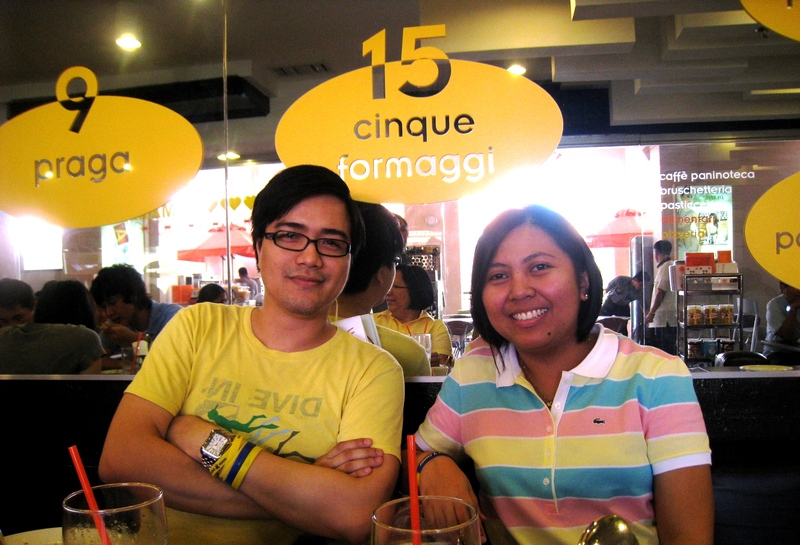 I owe him the discovery of my new pasta fave! 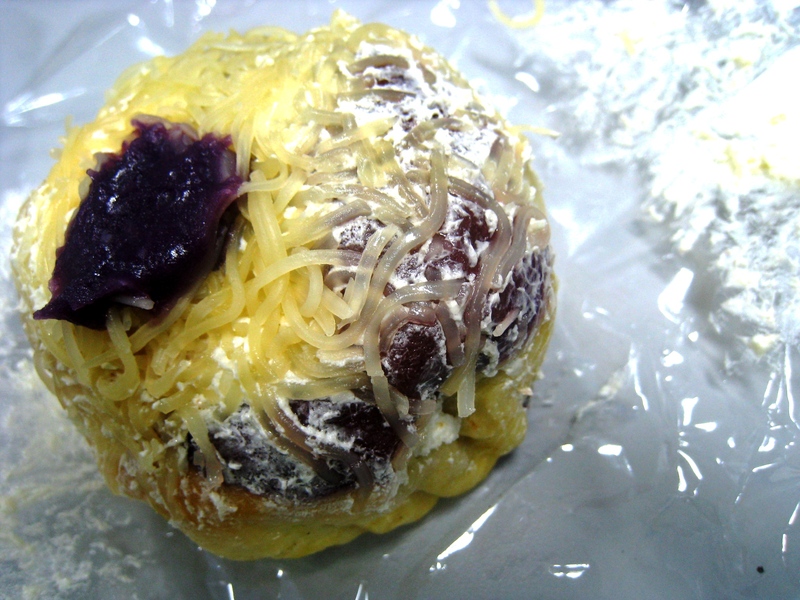 Copyright © 2011 by eNTeNG c”,)™©’s MunchTime™©. All rights reserved. Partner and The Boy Wonder. They make such a beautiful couple! While I did recognize the apprehension as to how my hair, so used to being wash-and-wear with the occasional treat of a-few-pesos-a-pop “clay doh” wax, would acquaint with Kérastase, what I picked up more was the birth of an amazing friendship. It has been over four years since. She has always believed in my talent that whenever she would have her own gigs, she would never fail to recommend me or tag me along. Most memorable was this beautiful December wedding we co-hosted. One day, at some point after that, she looked straight into me and said, “Partner, when I do get married, I want you to host my wedding reception.” I remember smiling not because I found it amusing – sometimes people blurt out spur-of-the-moment declarations not necessarily because they mean them but because they need to articulate an emotional build-up impossible to contain – I smiled because I knew she meant every word of it. I did know, on her birthday this year. We’ve constantly communicated. She being in the Lion city for close to three years now and me being here at home has proven futile in making us lose track of each other. And of course there’s my usual birthday greeting for her here on my blog – never the best gift she receives, but my best effort to make her feel special every single time. Each one would be followed by a flurry of e-Mails, phone calls, or text messages. What she revealed to me on this last one – her birthday falls in April – turned out to be the best birthday gift to trump all birthday gifts. The promise to grow old with someone who loves her and actually loves her more (than she does him – which should be the case, if you ask me). I couldn’t be happier that the guy happens to be one of my closest friends, The Boy Wonder. Two of the best people in my life coming together in love? What else is more beautiful? And the surprise proposal, done way up The Marina Bay Sands, was nothing short of cinematic, yet deeply personal. Just a moment between two people in love. And a ring. THE ring. Of course after Partner and I had gone through the nuances of the proposal, talk shifted to the bling. One ring to bind them both. Well, at least until they put on their wedding bands! Both from The Boy Wonder... 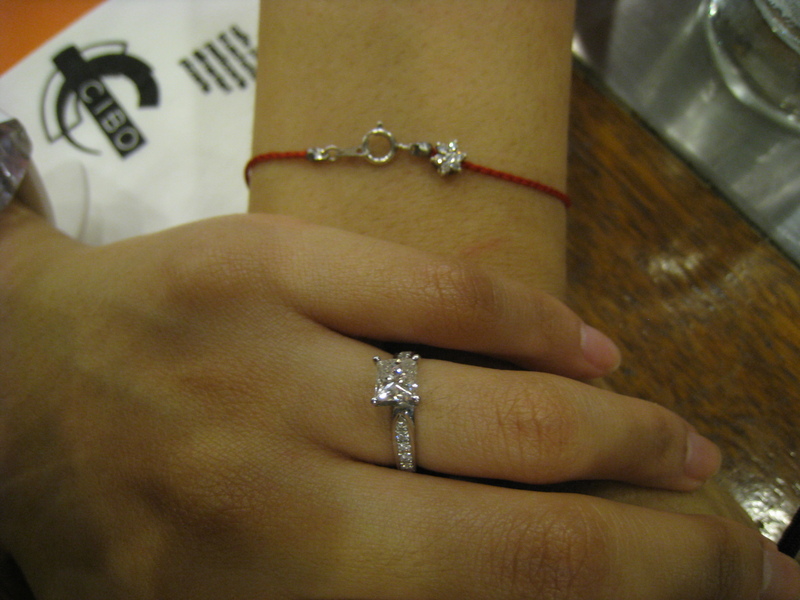 Partner's engagement ring and my red string bracelet bought in Korea. 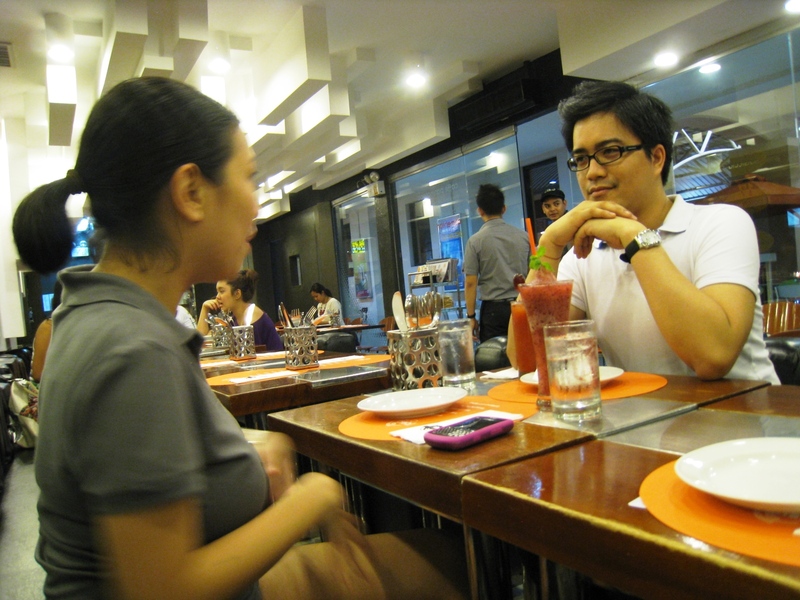 So you could imagine how breathless in anticipation I was when I went to meet them up last Tuesday. They took a short break to come back home and work on some of the details of their wedding. Details being, as they unfold, a list of some of their own “non-negotiables”. Again, at least from Partner’s end, my role happens to be one of those. I’m so honored. 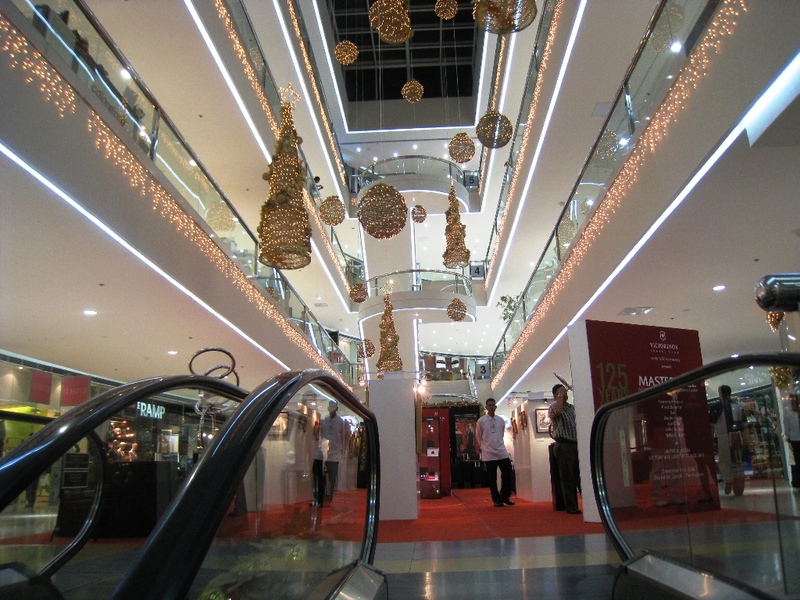 From the many options on the second level of Corte Delas Palmas, I led the way to Cibo. 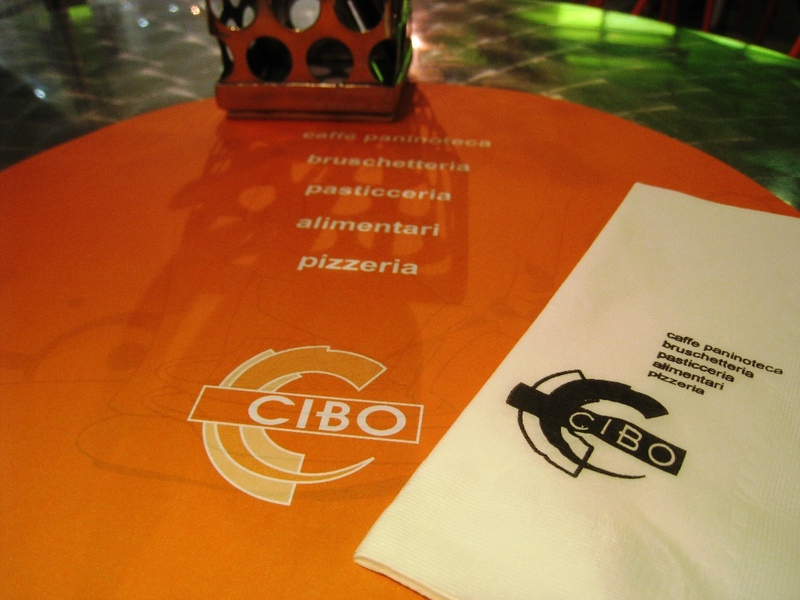 It actually just seemed I led, because Cibo happened to be the unanimous choice. Listening intently to Partner's updates. Finally, The Boy Wonder asked us to look his way. 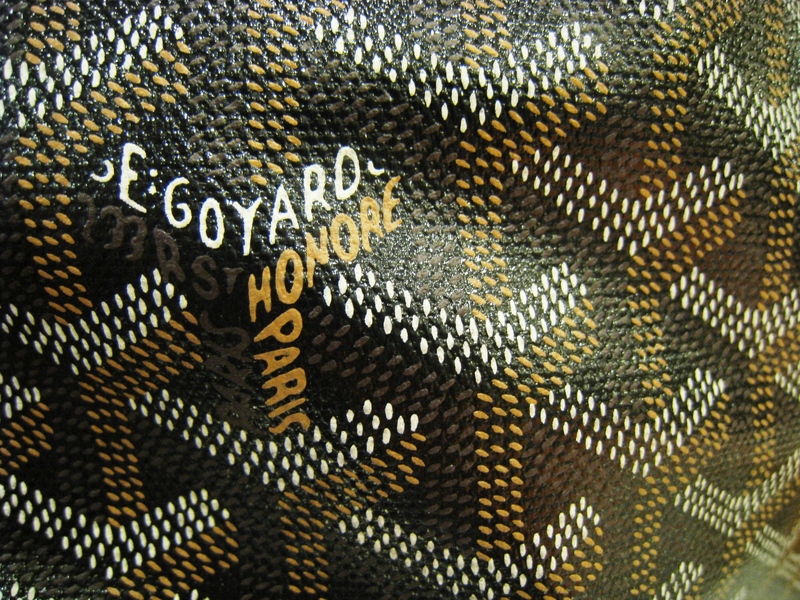 Partner came toting her new Goyard which she bought online and had shipped to her hotel room during a recent trip to the States. Iron Man furrowed his brows and looked back at me, parrying my seeming inappropriate question with an expected questioning look. Expected because I threw in my question right smack when he was negotiating a stringy portion of lechon (roasted pig) he was served. 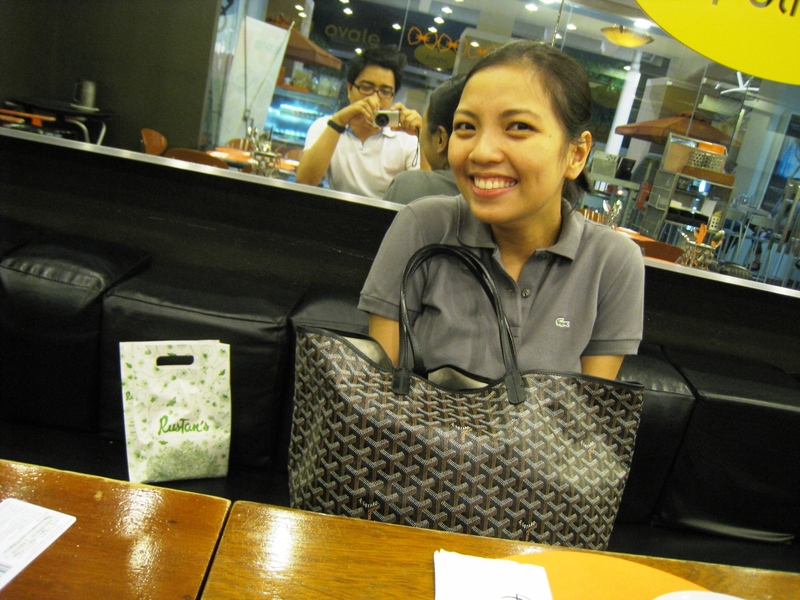 As for me, I’ve totally sworn off lechon, allowing me time to pester the superhero to my right. I caught him mid-bite, my question throwing him off from all the concentration he had focused on a yummy piece of meat. We were actually at the reception of a good friend’s son’s christening – yeah I know, all the more that my question reeked with insensitivity – but soon enough, I did get my prayer answered. And before long, off Iron Man and I went to Town to meet up with Brother for a movie (Harry Potter and the Deathly Hollows Part 1) and, you guess it right, Farfalle Alla Genovese! Where else but in Cibo! 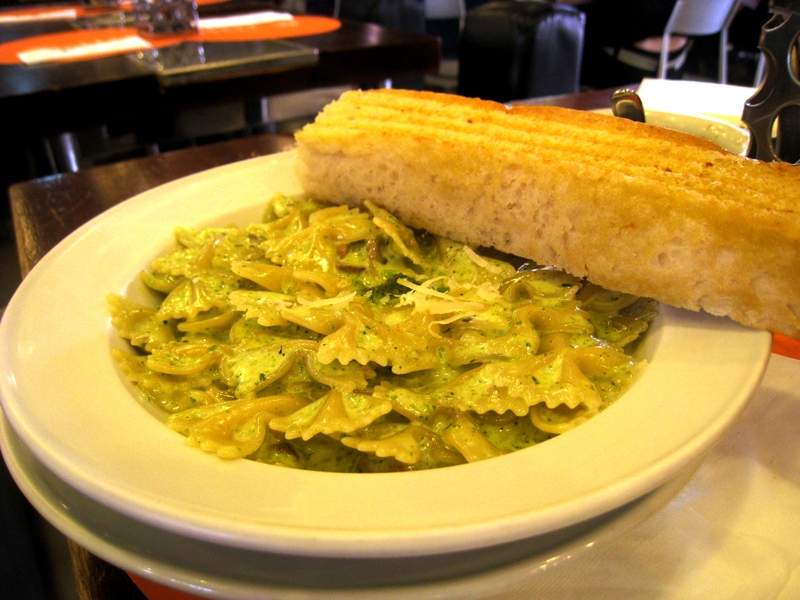 Bread and a fabulous dip took care of the necessary formality, and I didn’t allow any other – soup or salad – to get between me and my farfalle! Oh, I spoke too soon. There was Iron Man, with whom I shared the family sized-serving of this wonderful al dente bowtie pasta tossed with a fresh wild mushroom cream sauce and basil pesto, topped with a fresh grating of the best parmesan cheese and a few grinds of the pepper mill. For someone like me who favors tomato-based sauces over cream ones, Cibo’s farfalle alla genovese is the foremost exception. First serving of the pasta for Iron Man. 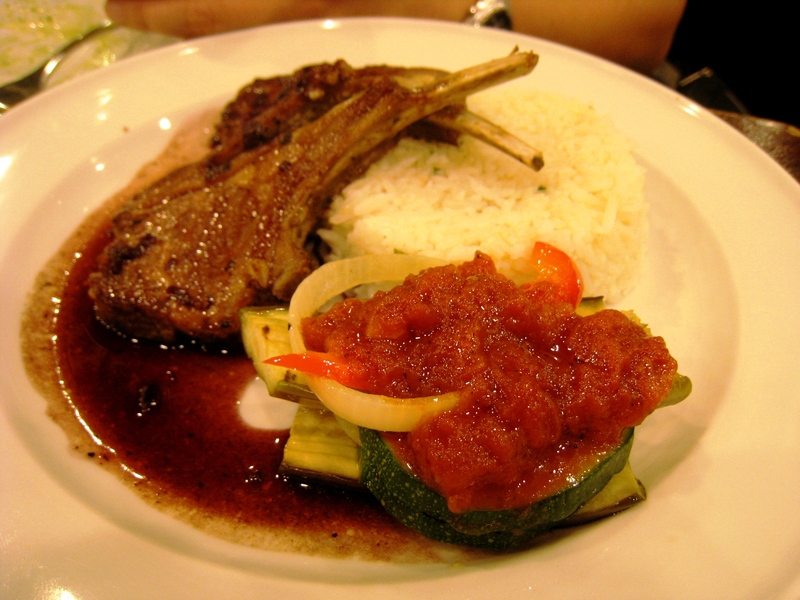 Brother, ever the carnivore, opted for the Costolette D’Agnello, a duo of well-done (his preference) grilled lamb chops, doused with a sauce of red wine reduction perfumed with mint, and served alongside a parsley rice pilaf. 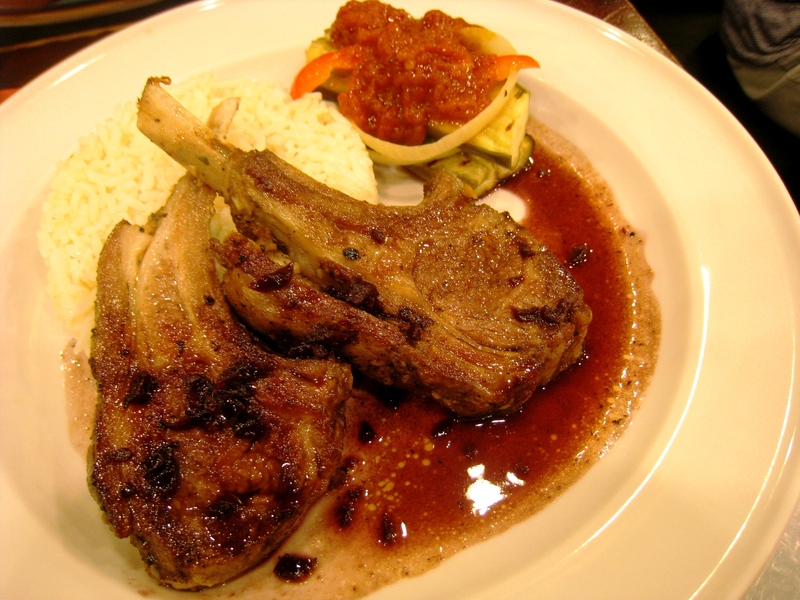 I’ve often heard that nothing beats tasting Italy in springtime than with the tenderness of lamb, grilled to perfection as the classic Costolette D’Agnello. I couldn’t vouch for that. 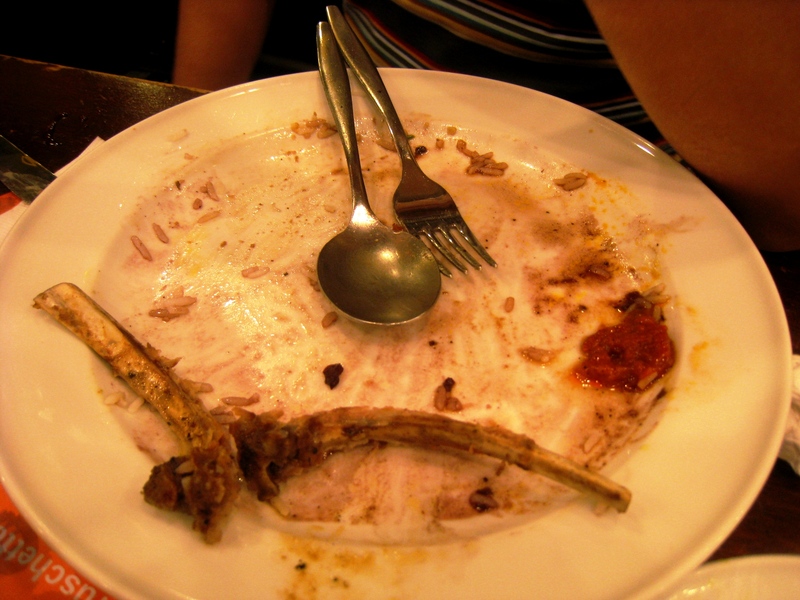 But Brother could, evidenced by whatever remained – or didn’t – on his plate. Brother let me have the grilled zucchini that came with the lamb. Brother prefers his meat well-done. 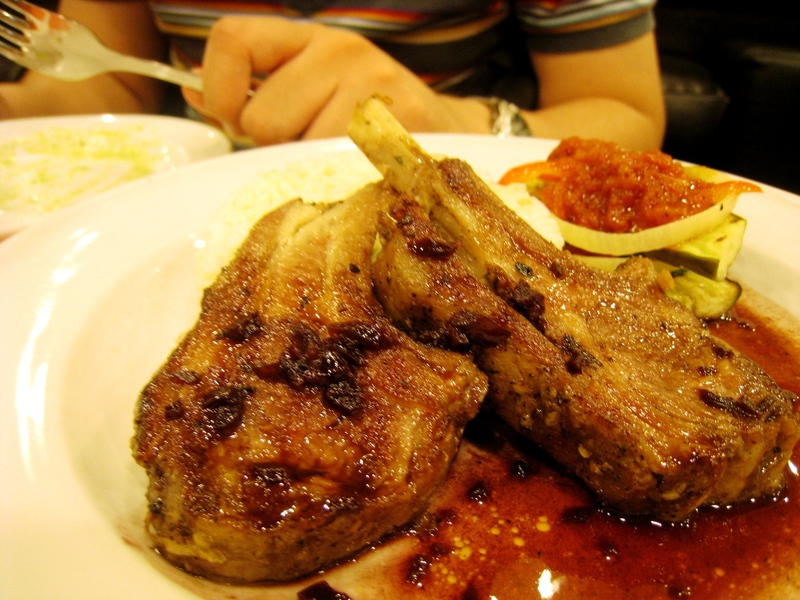 And these chops are well-done and yet still tender and flavorful. See what I mean? This is one of the things that I love having dinner with Brother. We're both such "enthusiastic" and "appetizing" eaters! 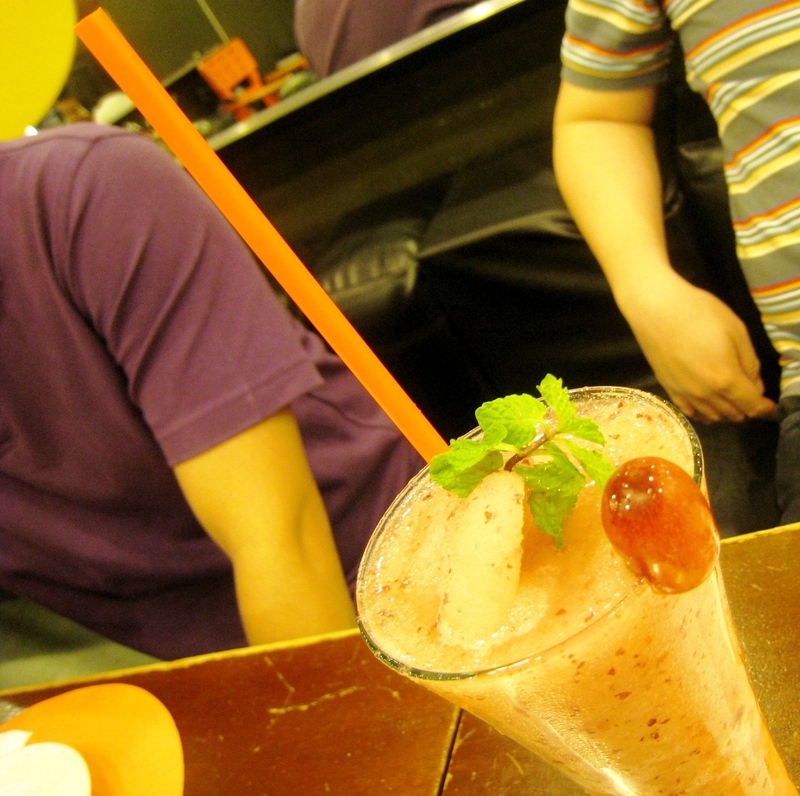 Iron Man and Brother loaded up on anti-oxidants by way of red grape shakes! Of course I had my favorite Tomato Juice! Lycopene-loading! *For five nights in a row, I’ve been putting “Moulin Rouge” on. On a couple of nights, to send me to deep slumber. But on the others, to put the “Your Song” clip into heavy rotation – singing along all the time. For this blog post, the song “One Day I’ll Fly Away” came to mind and inspired the title above. 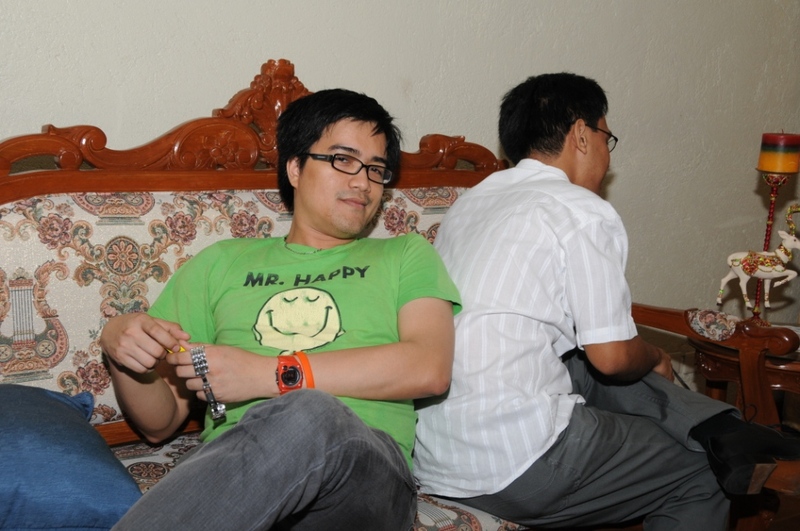 Copyright © 2010 by eNTeNG c”,)™©’s MunchTime™©. All rights reserved. 36. 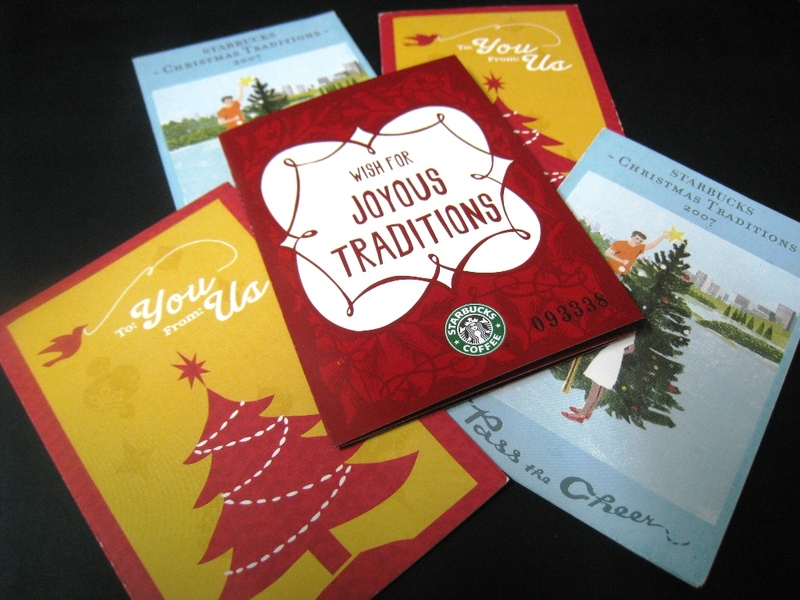 AFTER THREE unsuccessful attempts, I’ve finally completed the Starbucks® Coffee Company’s Christmas Traditions Promo Card. 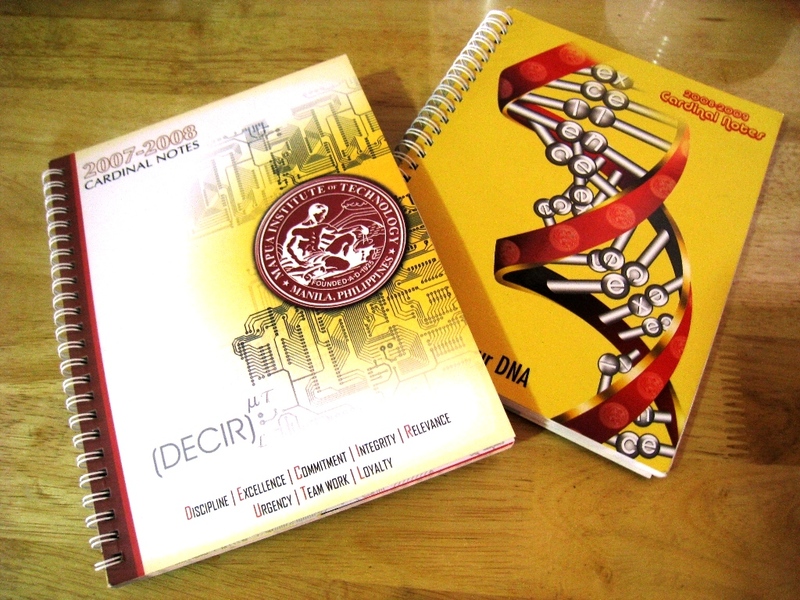 I redeemed my 2010 planner at their Las Piñas store on New Year’s morn, just hours after I was treated at the hospital for firecracker-related injury – also a first. 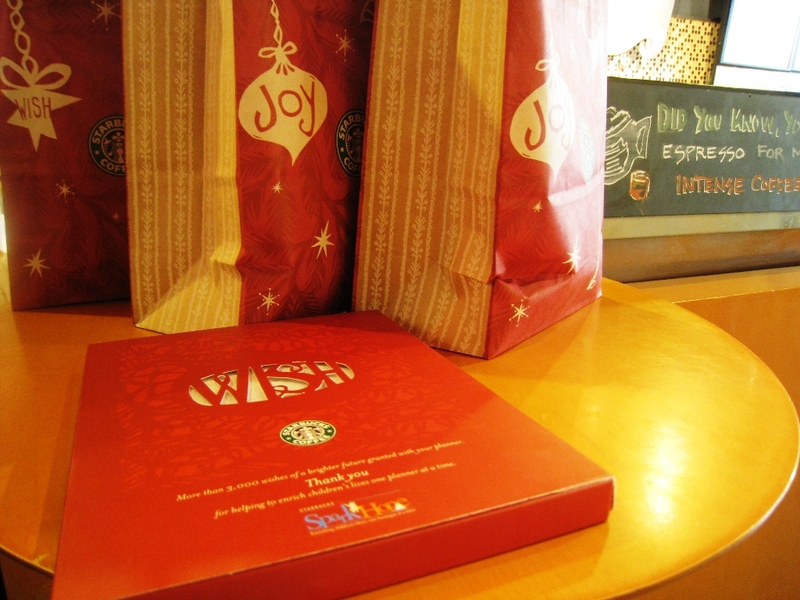 My Starbucks 2010 Planner, plus three bags of New Year's gifts. 35. I’ve been in the same job for the past 14 years and two months. 34. 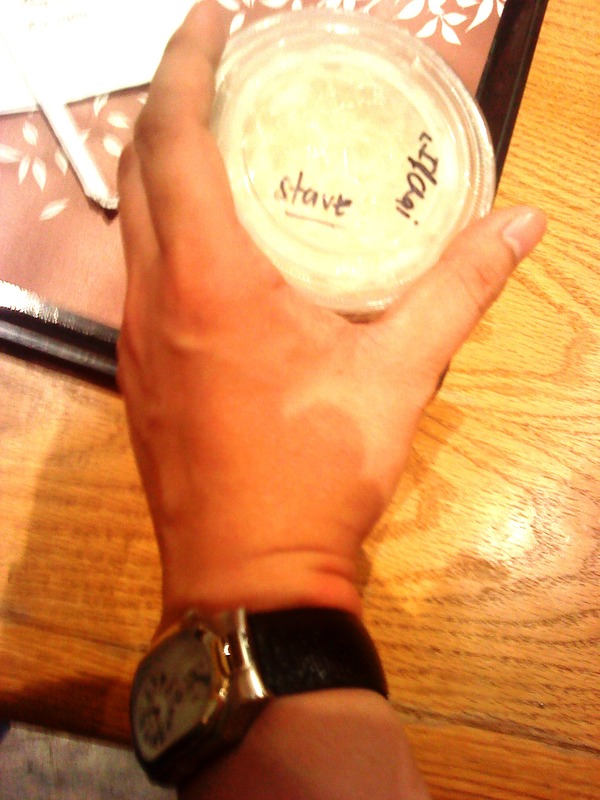 My beverage of choice be it at The Coffee Bean & Tea Leaf or at Starbucks® is Hot Chai Tea Latte served over ice. Strong on the freshly steeped tea, easy on the steamed milk. Unfortunately, neither has perfected it, just the way the Sodexho Coffee Bar at Intel Corporation in Folsom makes it. 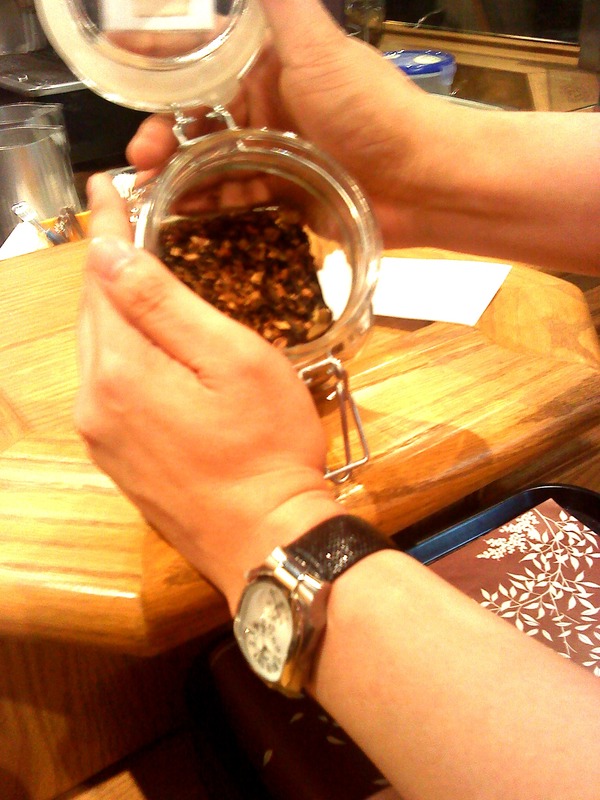 The very kind staff at Coffee Bean & Tea Leaf didn't mind me taking a shot of their fragrant chai tea loose leaf blend. It was a bouquet of cardamom, cinnamon, star anise and fennel, with hints of ginger and black peppercorn. My chai tea latte over ice is finally served! Notice that it's quite milky white, unlike in the States where they put more of the steeped tea. Chai tea latte should be a mug of spicy black tea with milk and sugar, profuse with notes of cardamom, cinnamon, star anise, fennel, ginger, and black peppercorns. 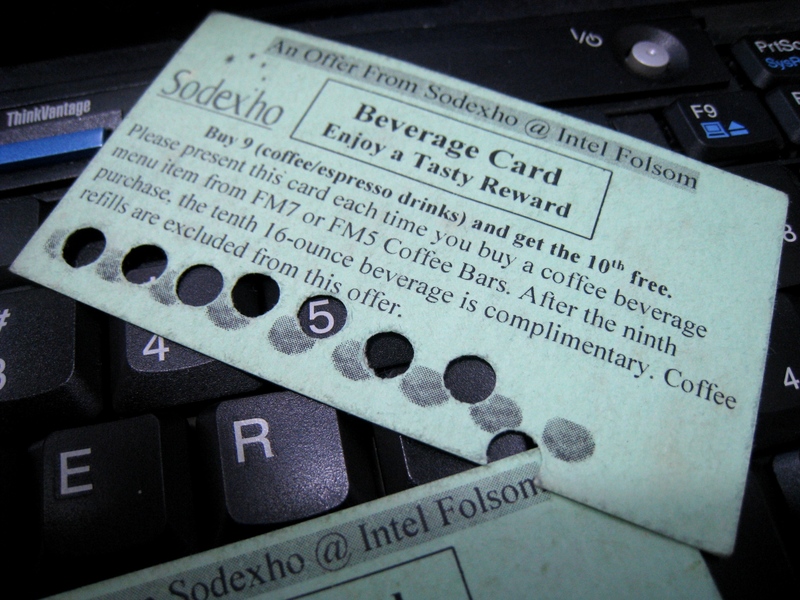 I've kept these beverage rewards cards all these years. 33. I’ve been meaning to prop up my Americana Wooden Birdhouse at the terrace. But I haven’t gotten around to actually doing it. 32. The first time I’ve ever seen a movie on 3D here at home was when I saw Toy Story 3. I thought the Dolby 3D glasses over my Emporio Armani prescription spectacles were putting too much strain on my eyes. I didn’t know the lump that was forming in my throat had managed to escape through my eyes. 31. 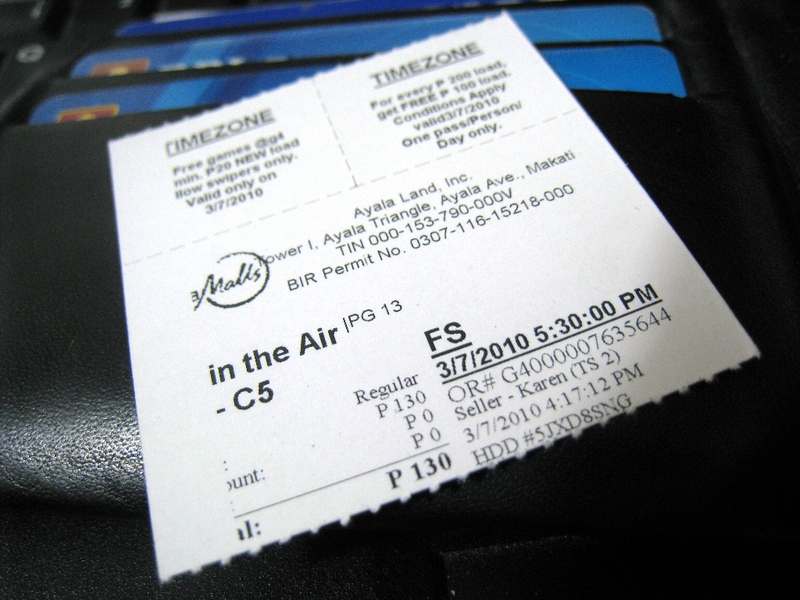 The best motion picture I’ve seen in the past six months is Up In The Air. 30. 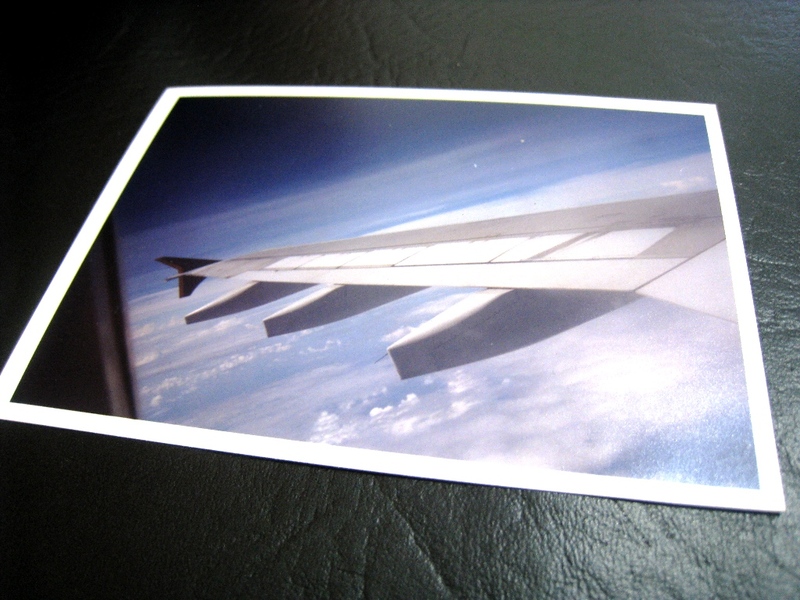 During flights, I take photos of the airplane’s wings at 30,000 feet. Took this photo of an airplane wing on a flight from Penang in Malaysia to Singapore. 29. I’ve never seen an episode of Glee. But I never miss watching Royal Pains weekly – on its original time slot and on both its encore screenings on Saturdays. 28. 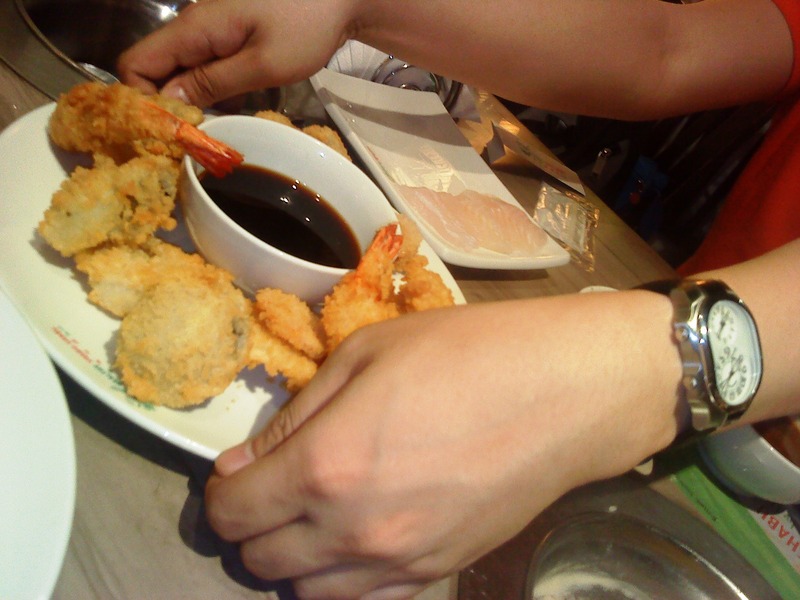 While I prefer tempura batter to be light and fluffy, I don’t mind the heavy batter Healthy Shabu-Shabu uses on their mixed tempura. My favorite in their platter is the shiitake mushroom caps. 27. 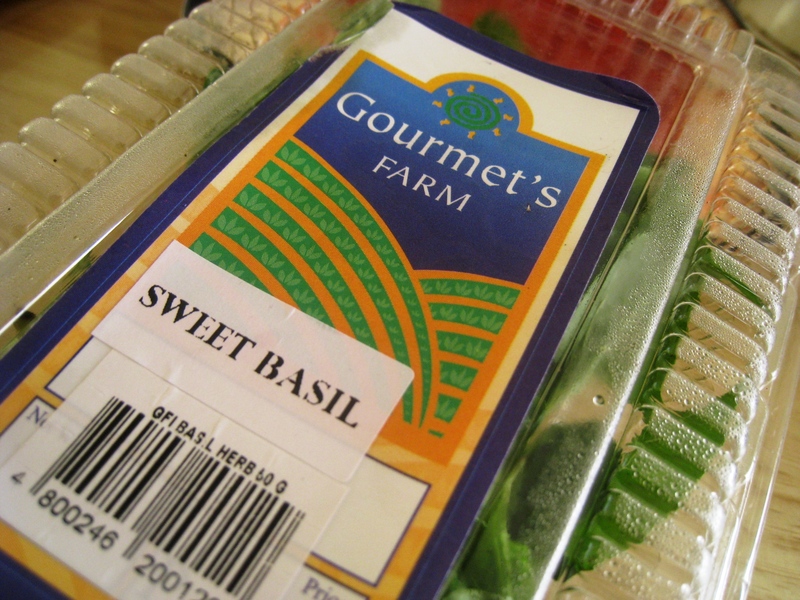 Gourmet’s Farm grows the sweetest, most fragrant basil leaves. I bought one packet, stuck it in the fridge, and forgot about it. Three days later, when on a whim I made my angel hair pomodoro, I got arrested by the unusually heady, invigorating scent that tearing Gourmet’s Farm’s basil leaves emanated. Basil had never smelled that good to me! 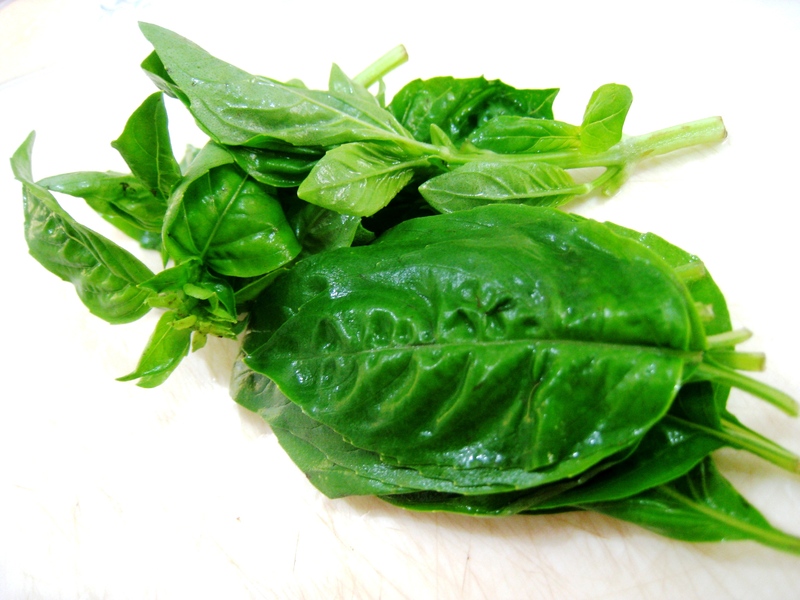 Really fragrant Gourmet's Farm sweet basil leaves ready to perfume my pomodoro sauce. 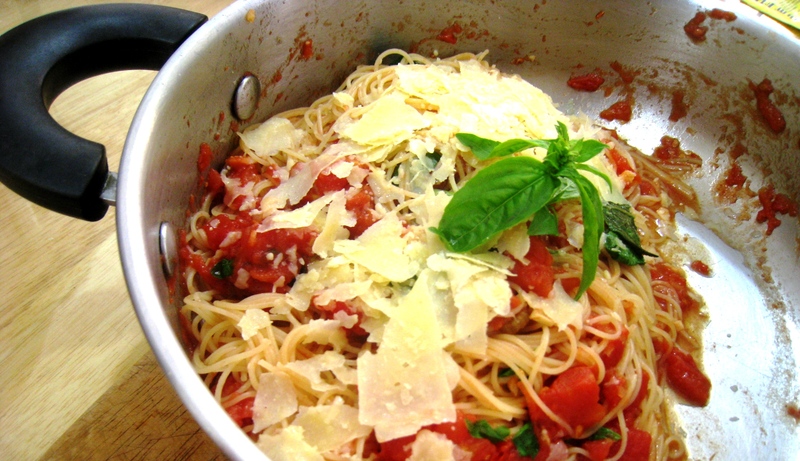 The actual Angel Hair Pomodoro I first used Gourmet's Farm's Sweet Basil on. Sumptuous! 26. Mapúa Institute of Technology, where I studied in high school, was near Baker’s Fair where I used to get my favorite hopia monggo. 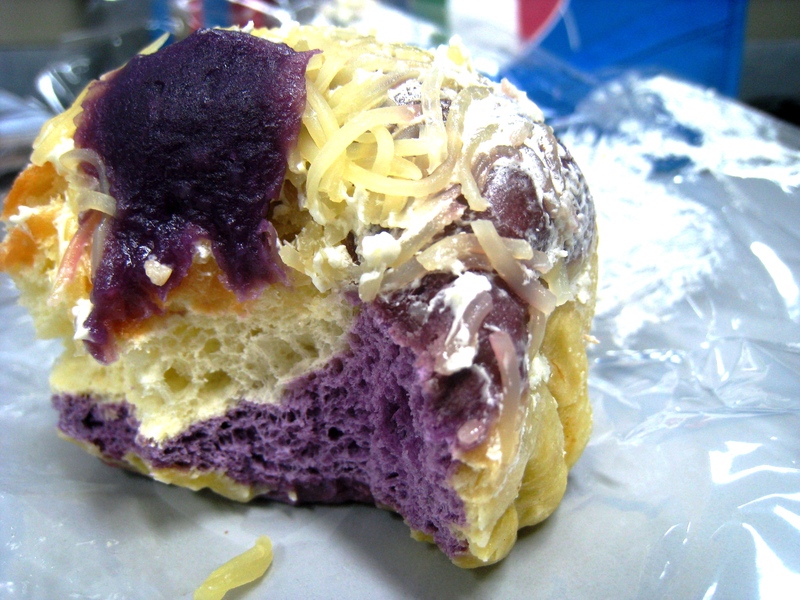 Nineteen years later, I serendipitously discovered their ube ensaymada. Simply scrumptious! Purple yam swirls through the brioche. 25. 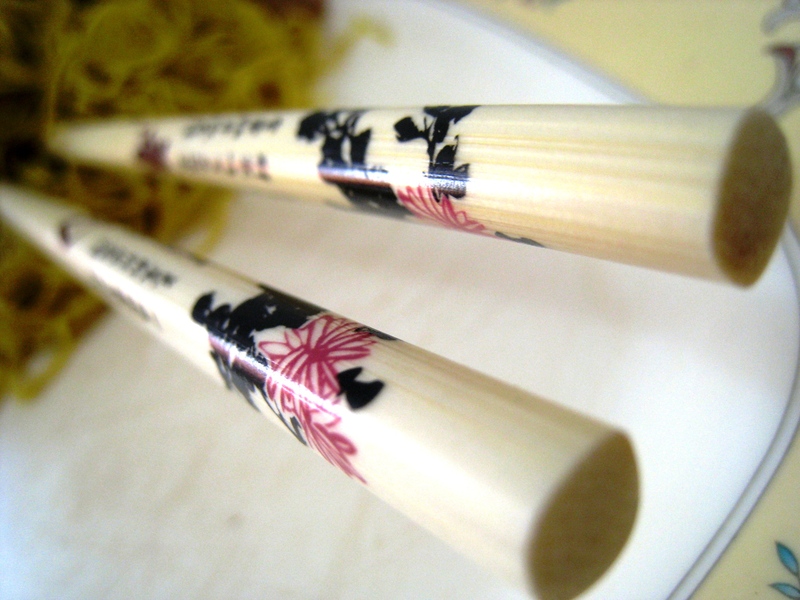 I eat noodles using chopsticks from Shanghai that my friend Tenz gifted me with. 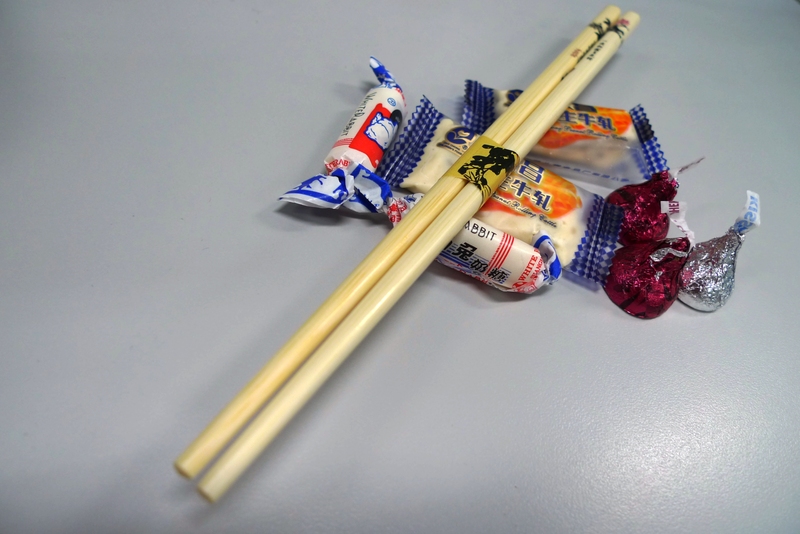 Chopsticks from Shanghai, courtesy of Tenz. My favorite chopsticks piercing through a pile of Beef Tendon Noodles from Kim Hiong! 24. The big Zara S-A-L-E is going on. 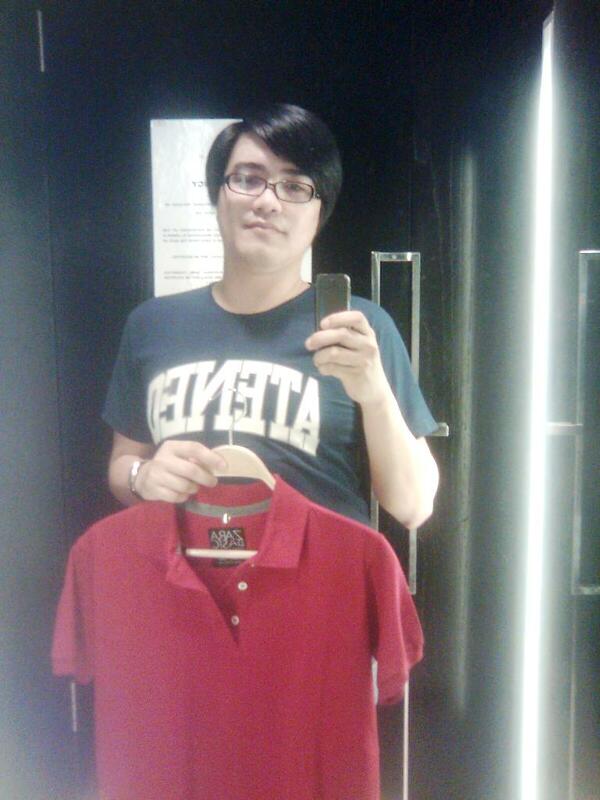 There is one item I didn’t get before – because it was still full-priced. Hahaha! I wonder if it’s still available. 22. 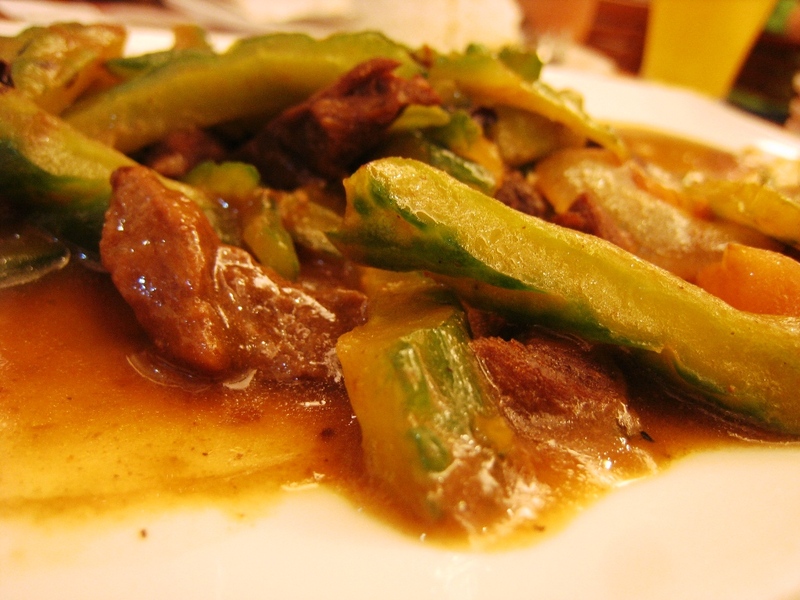 The only vegetable entrée I consistently ask for everywhere is Ampalaya Con Carne (bitter gourd with beef in a fermented soybean sauce). 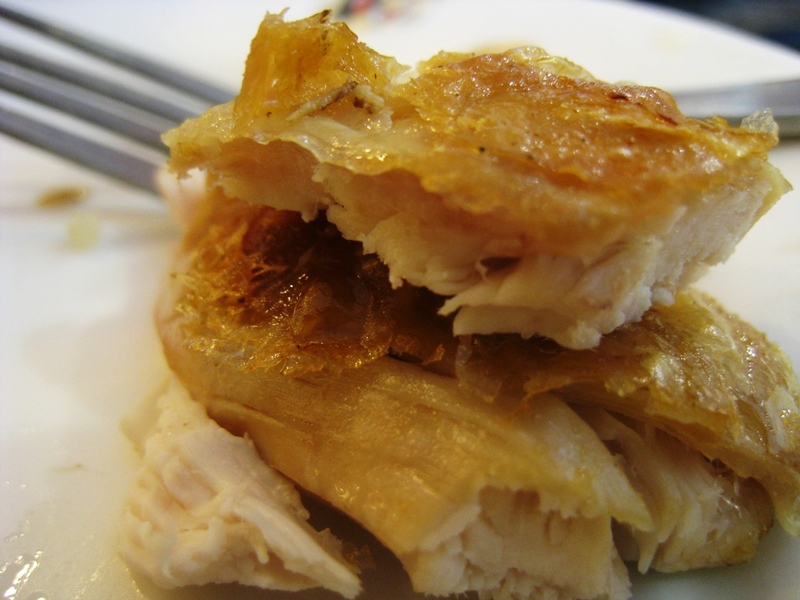 At Max’s, I’d rather have that than the all-you-can-eat fried chicken they are currently offering at a very reasonable – almost a steal – Php 165.00. 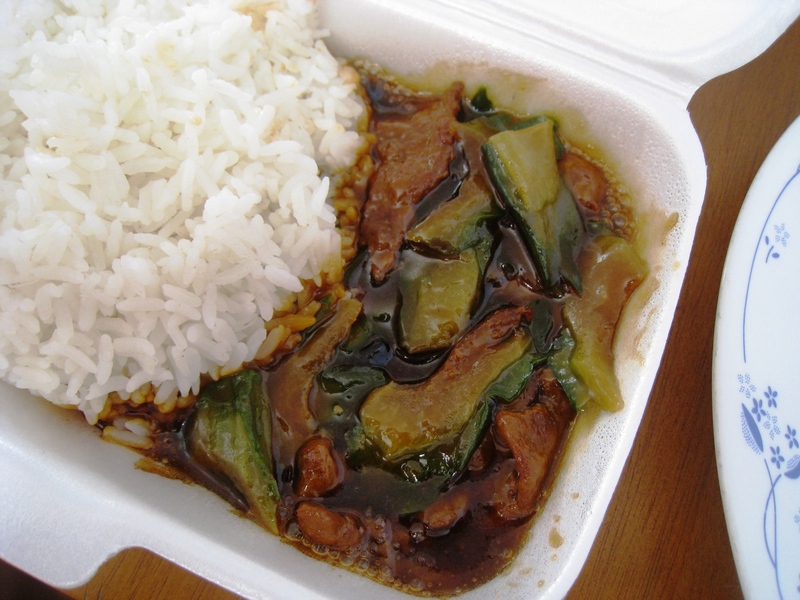 At Maxim's Tea House, Ampalaya Con Carne with Rice can be had to go. 21. I prefer fried chicken to be doused by nothing more than a good Worcestershire sauce. 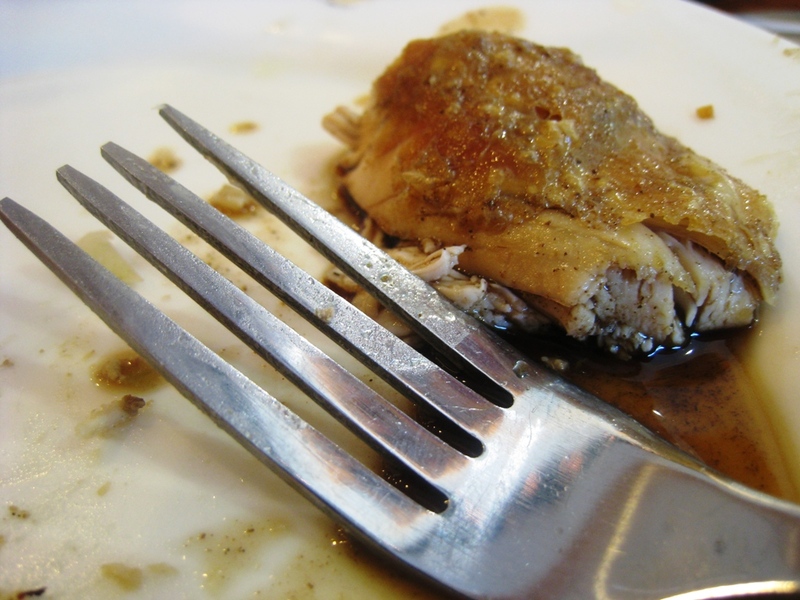 Worcestershire sauce does wonders to fried chicken! 20. 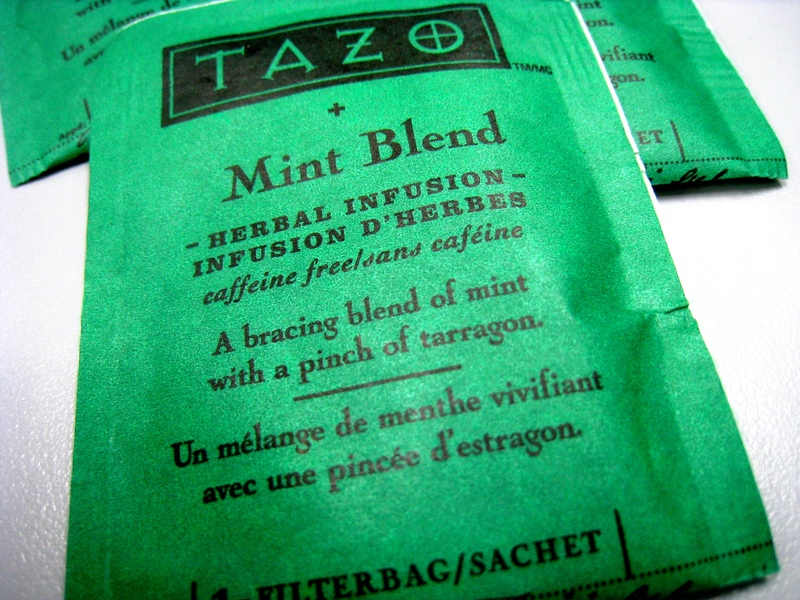 My tea of the moment is TAZO Mint Blend, courtesy of my Ninong Allan Paz. 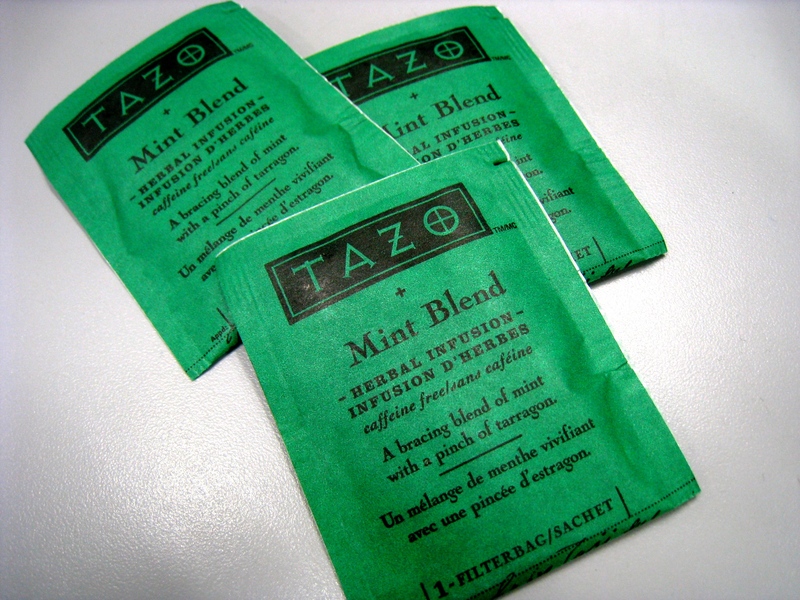 It’s a caffeine-free herbal infusion described as a bracing blend of mint with a pinch of tarragon. Doesn’t that sound lovely?! A pile of this wonderful tea from Ninong Allan Paz! The description of this tea blend alone is half the fun already! 19. 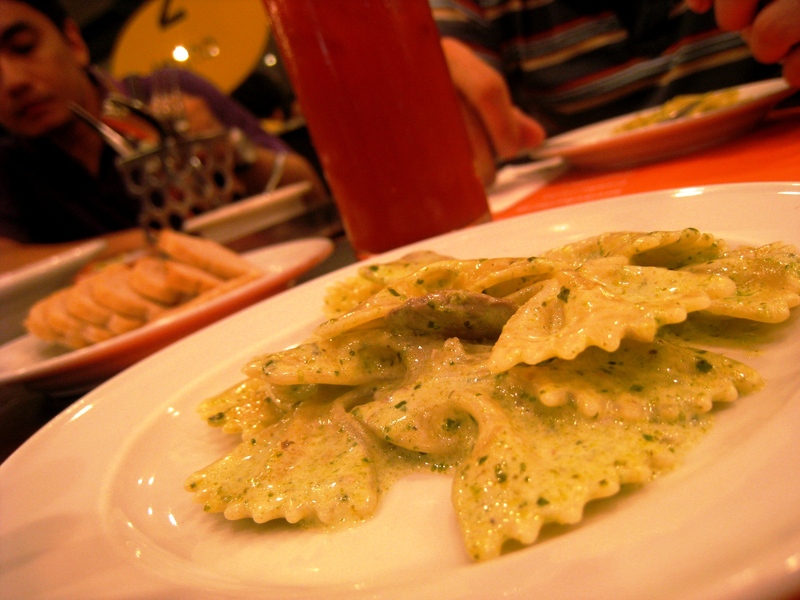 I adore Cibo’s Farfalle Genovese. 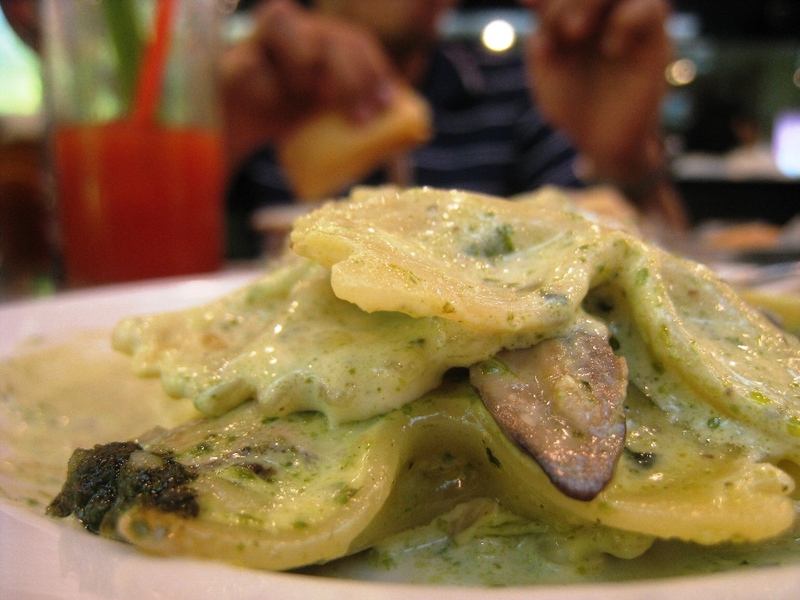 This dish of farfalle (bowtie pasta) in a wild mushroom cream sauce with fresh basil pesto is both heaven on a plate and a party in your mouth. 18. 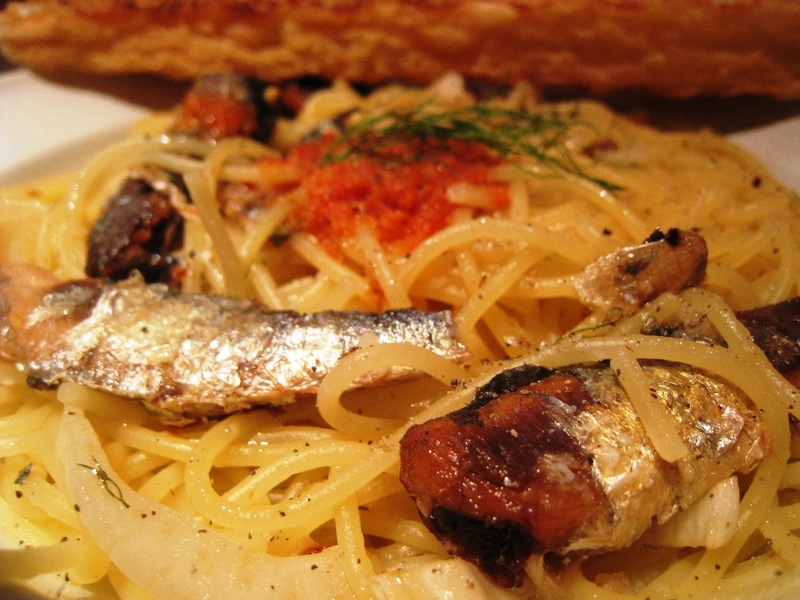 Still at Cibo… I always ask for extra slices of fennel bulb and fronds whenever I have a plate of their Spaghettini Alla Romana (spaghettini with sardines in oil, fennel, and red pepper pesto). 17. 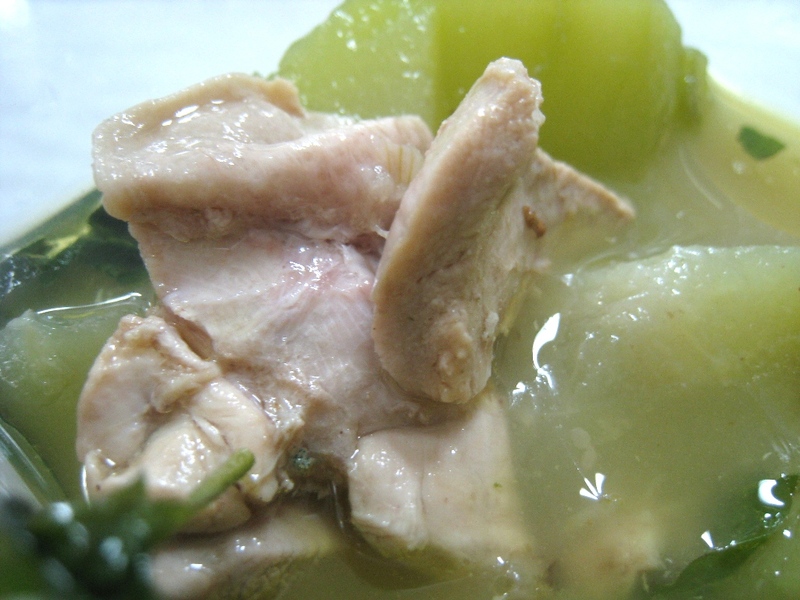 My favorite Chicken Tinola (chicken in a gingery broth with chili leaves) is not my own, but my friend Stave Michael’s. 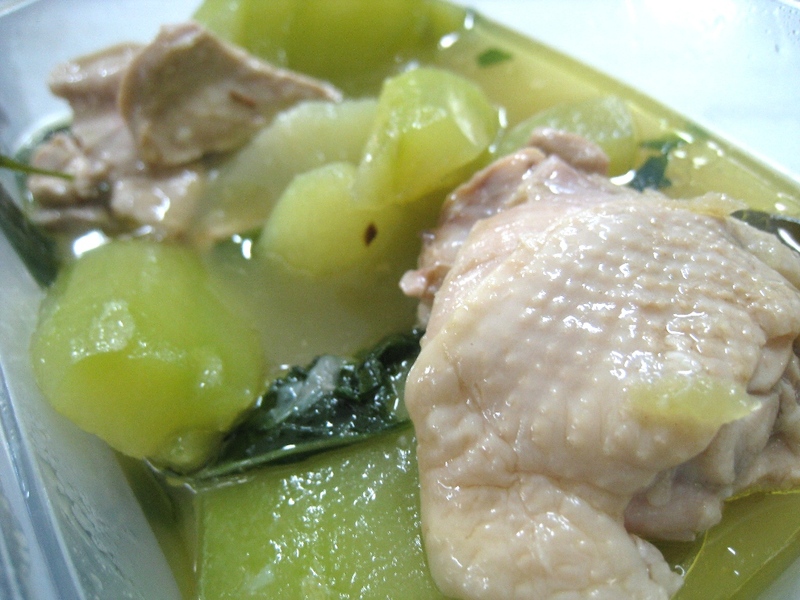 This has got to be the best homecooked Chicken Tinola I've ever had. 16. 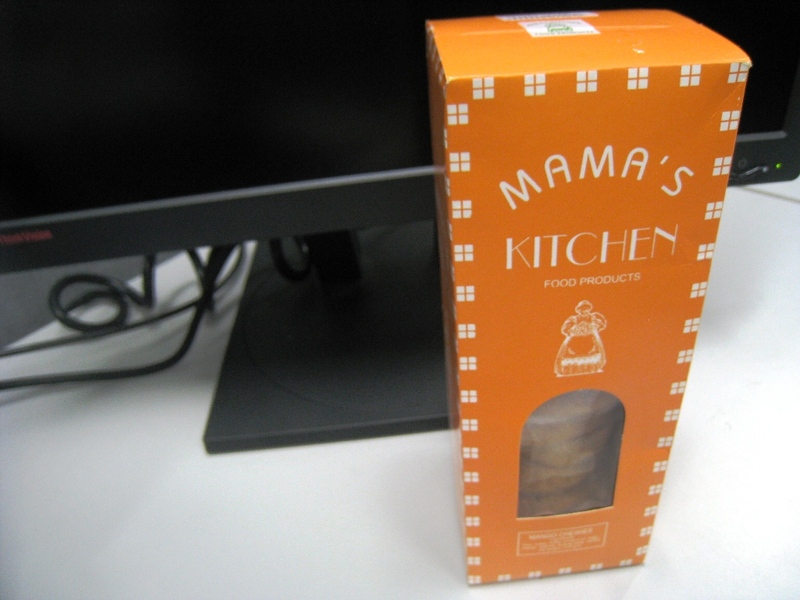 My favorite commercially available cookies are Mama’s Kitchen’s Mango Chewies from Iloilo City. 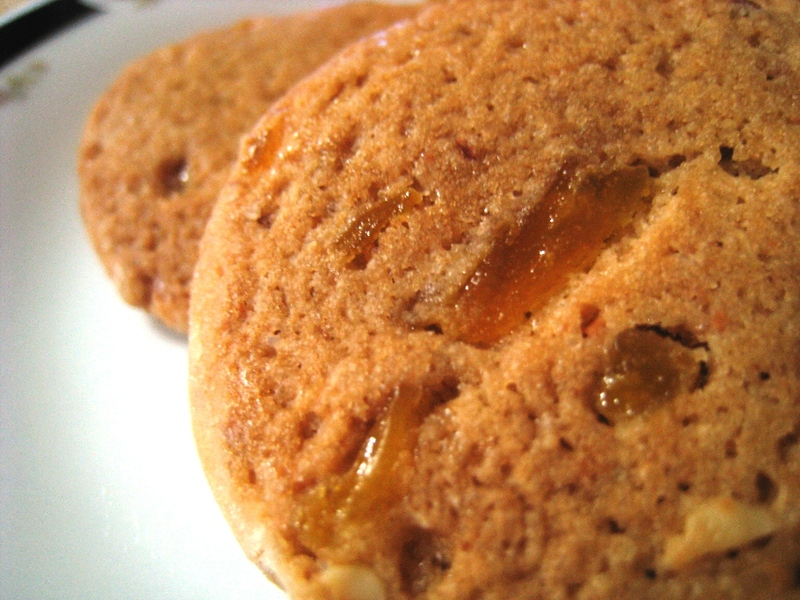 These are the best cookies! 15. Buon Giorno! 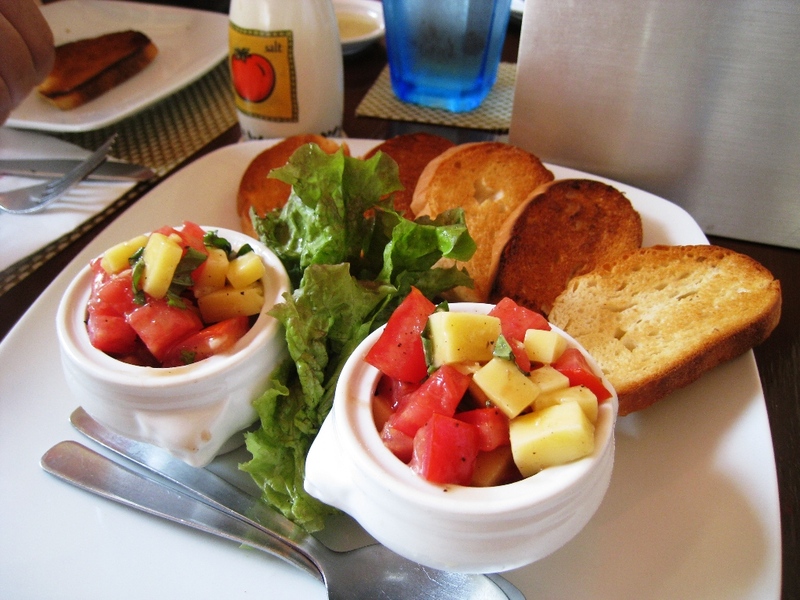 at the Cliffhouse in Tagaytay makes amazing Bruschetta and Insalata Caprese (Caprese Salad – tomatoes, basil, buffalo mozzarella). 14. 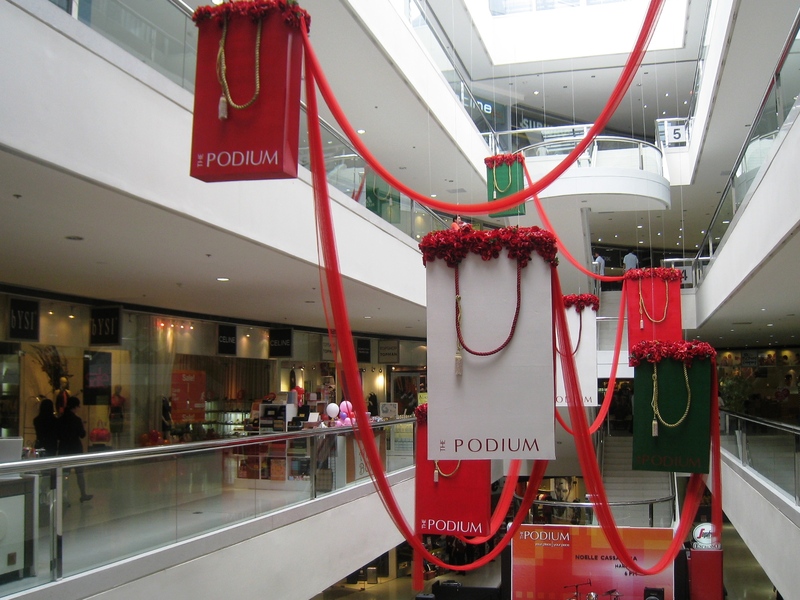 Of the many malls, The Podium gets decked in the best Christmas decorations. 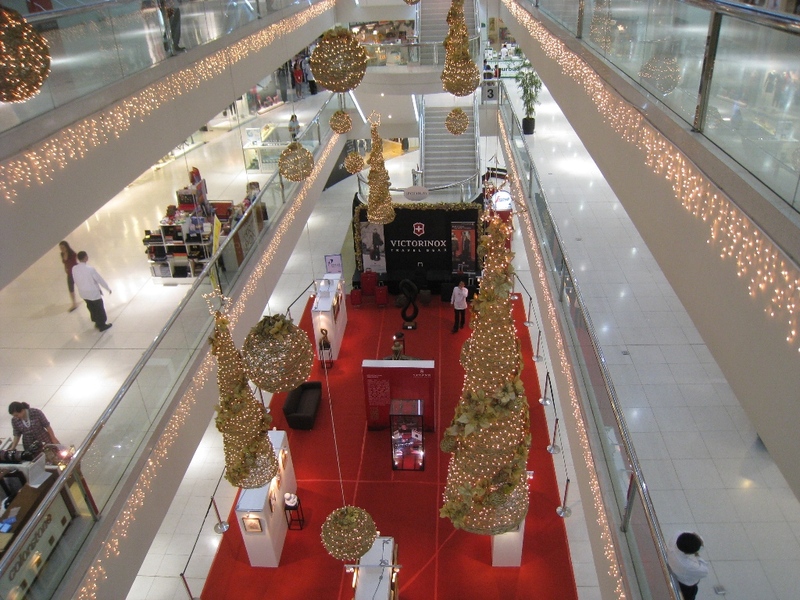 In Christmas 2009, Victorinox Swiss Army held an exhibit at The Podium. 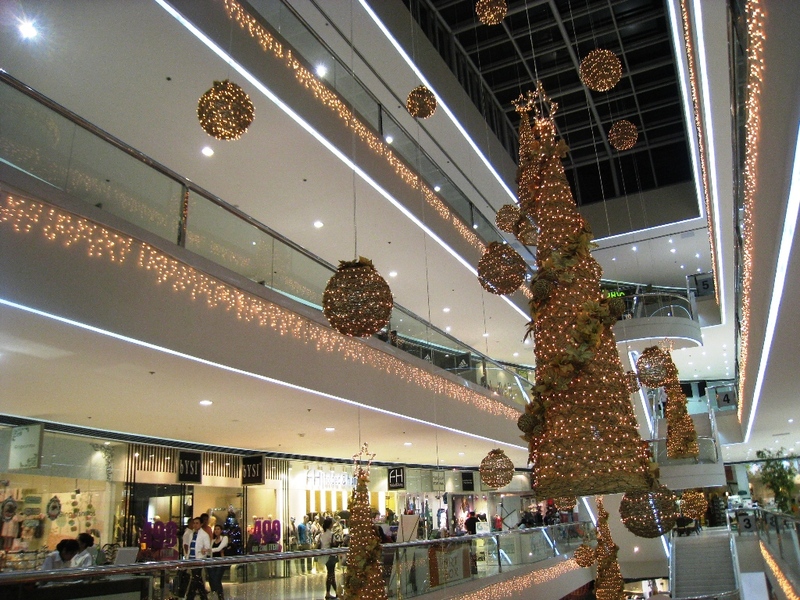 I loved the golden Christmas trees that hung from the ceiling. 13. 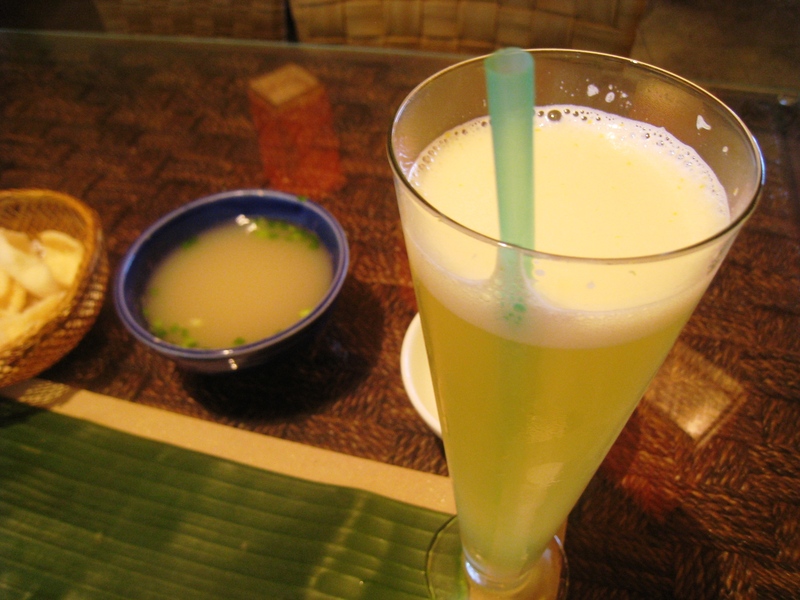 Whenever it’s on the menu, I ask for fresh Chrysanthemum Juice. Here, I get it only at Banana Leaf and at North Park. 12. 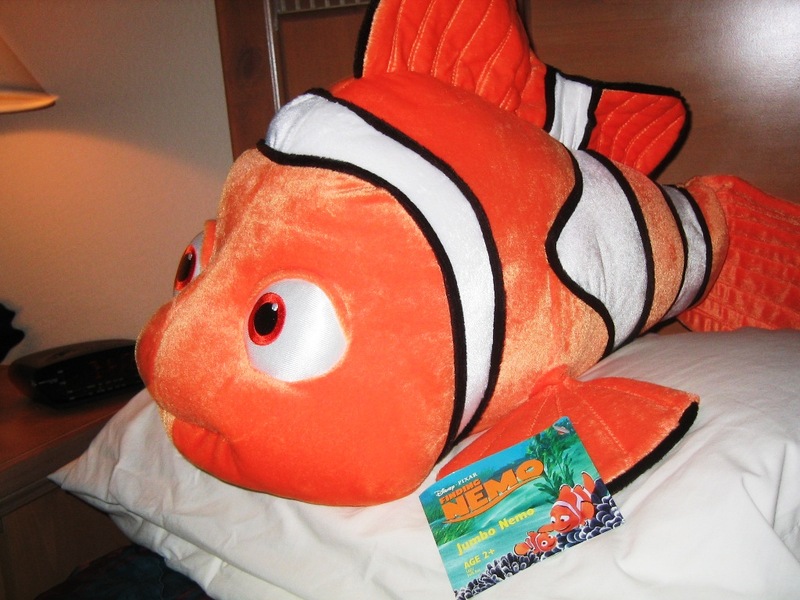 Long before Up and Toy Story 3 wrung my lachrymal glands dry, Finding Nemo had done so seven years earlier. 11. I waited for the results of the voting in the 121st IOC Session, and I was quite saddened when Chicago lost in their bid to host the Games of the XXXI Olympiad (the 2016 Summer Olympics). 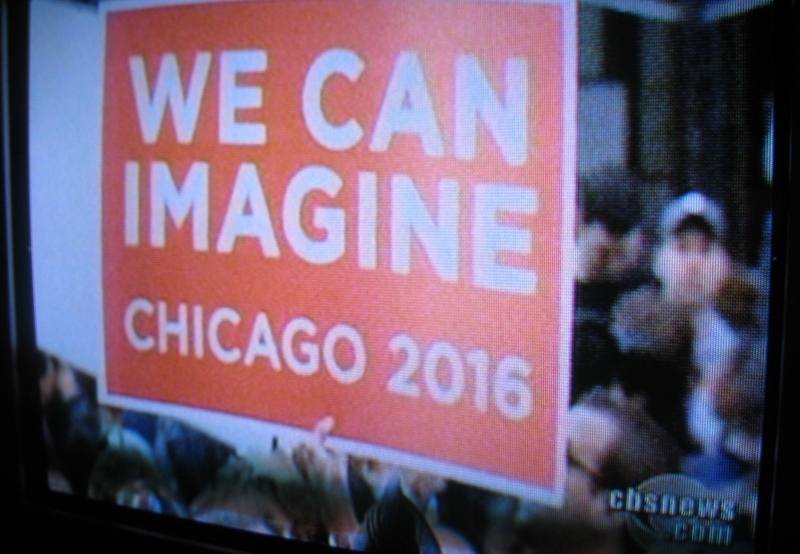 One of the placards in downtown Chicago as the city awaited the announcement of the winning host for the 2016 Olympics. 10. 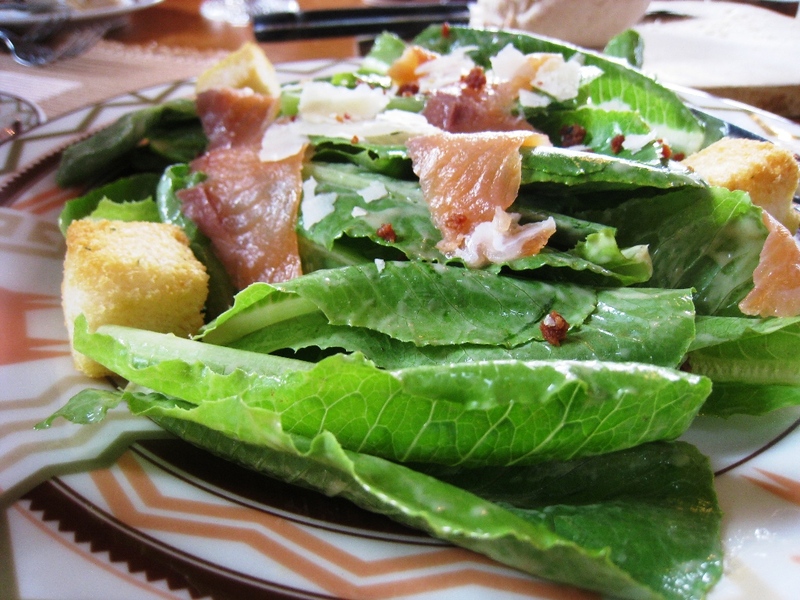 The Highlander Steakhouse at Tagaytay Highlands makes an excellent Salad of Hearts of Romaine and Smoked Salmon. I served myself with a lot of the smoked salmon! Greeedyyy!!! 9. I’ve had the best Chicken Curry dishes at over 30,000 feet up in the sky, on board Air India and Jet Airways flights. The New Bombay Authentic Indian Cuisine at The Columns on Ayala Avenue and at The Podium is a nice place to go to here at home. 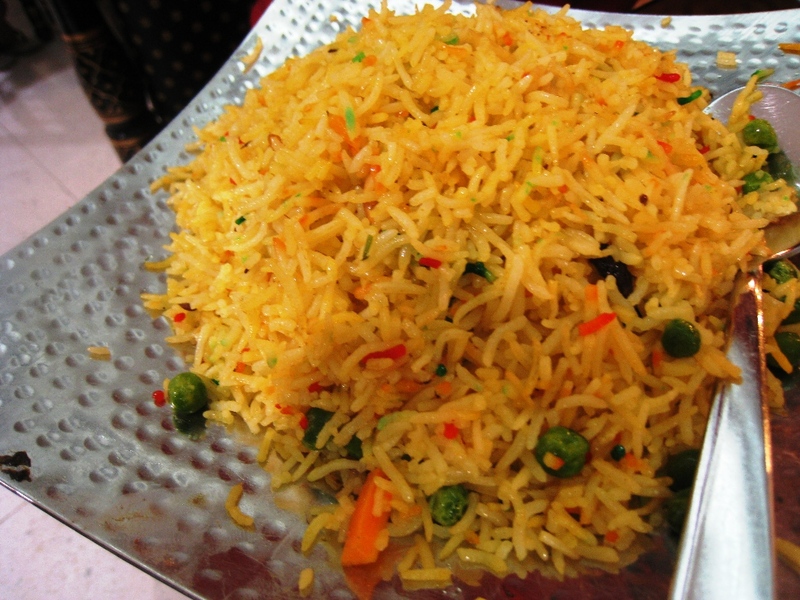 Besides the curry, I super love their Saffron Basmati Rice. 8. 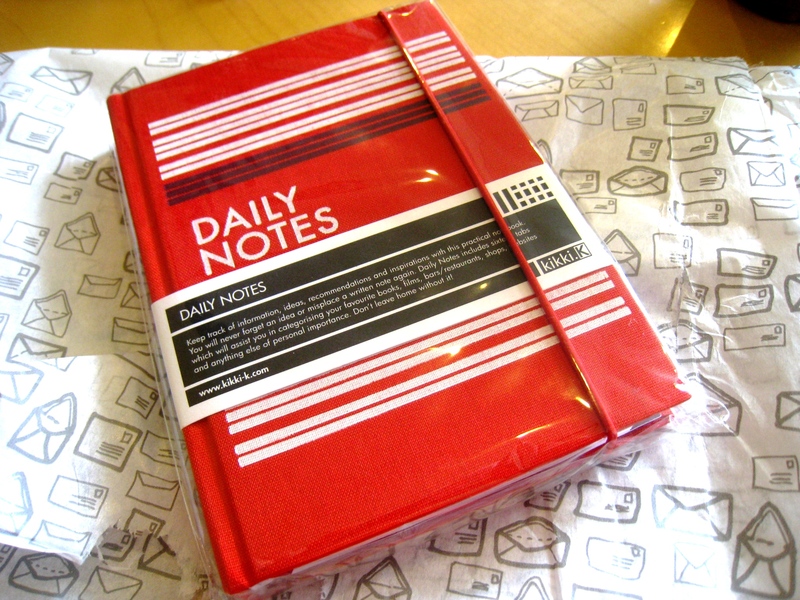 I have three notebooks in current (simultaneous) usage status – the Superman notebook I made, the Cardinal Notes from Mikko, and the Daily Notes by kikki.K from Friendship. They’re for my essays, work, and all other notes of personal importance, respectively. 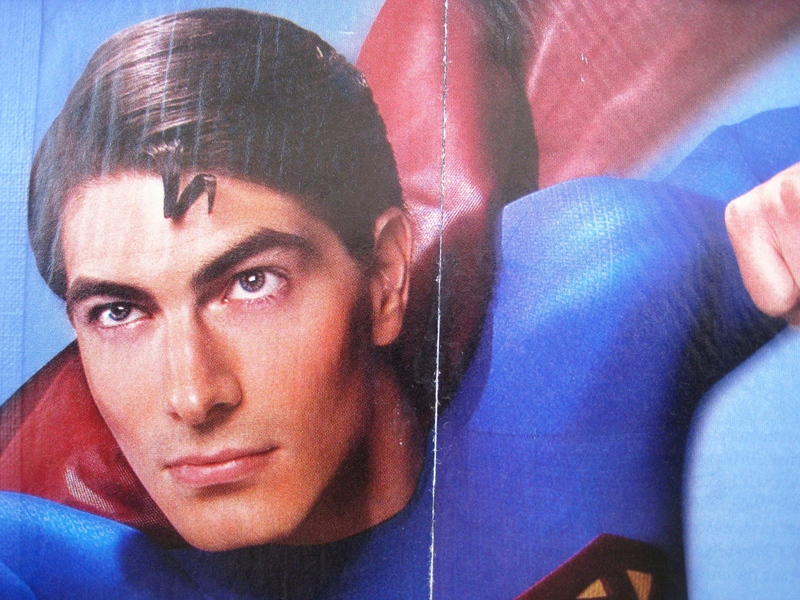 The cover of the Superman notebook I made. 7. More than ever, I have become really grateful for friends far and wide. Not a single day passes by without me having conversations with Friendship, Batman, and Superman – no matter how busy each of us may be. 6. 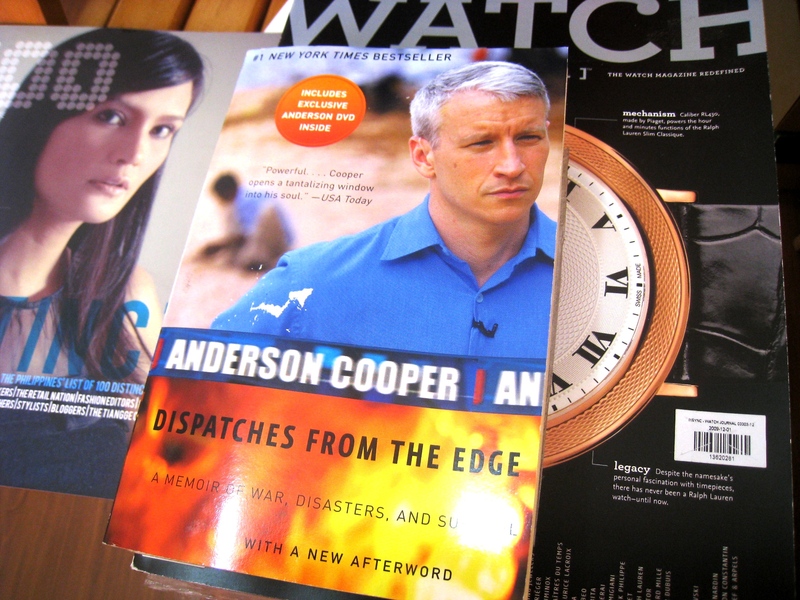 I’ve developed a deeper appreciation of Anderson Cooper, anchor of CNN’s AC 360O, after reading his memoir Dispatches from the Edge: A Memoir of War, Disasters, and Survival. My book of the moment! 5. I woke up with Maroon 5’s Sunday Morning playing incessantly in my head. Sang it a number of times in the shower. So it turned out to be a looong shower. 4. For three years in a row, Batman has always been the first one to greet me on my birthday. And there has always been a gift. I sure hope he does keep that tradition this year. Hahaha! 3. I’m craving for the U.S. 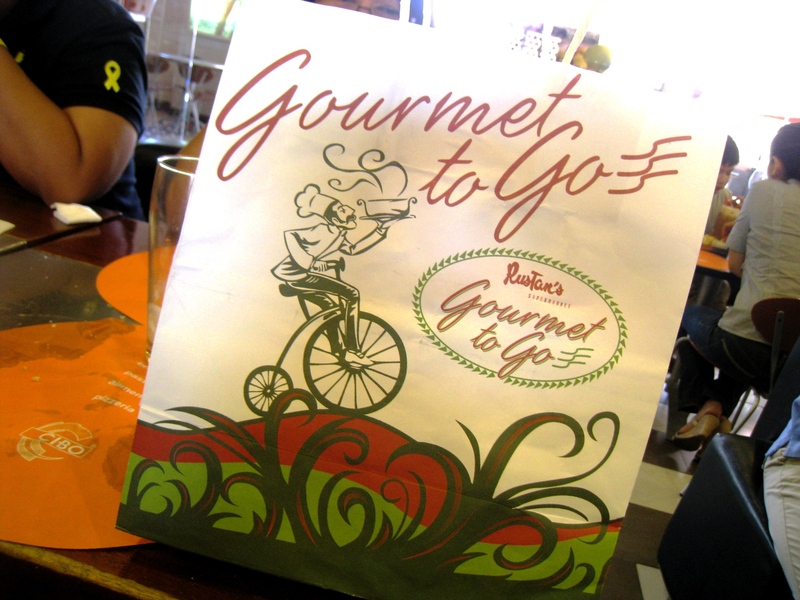 Beef Ribcap Tapa & Garlic Overload at Mr. Jones in Greenbelt 5. TheCorporateTeener highly recommends it. 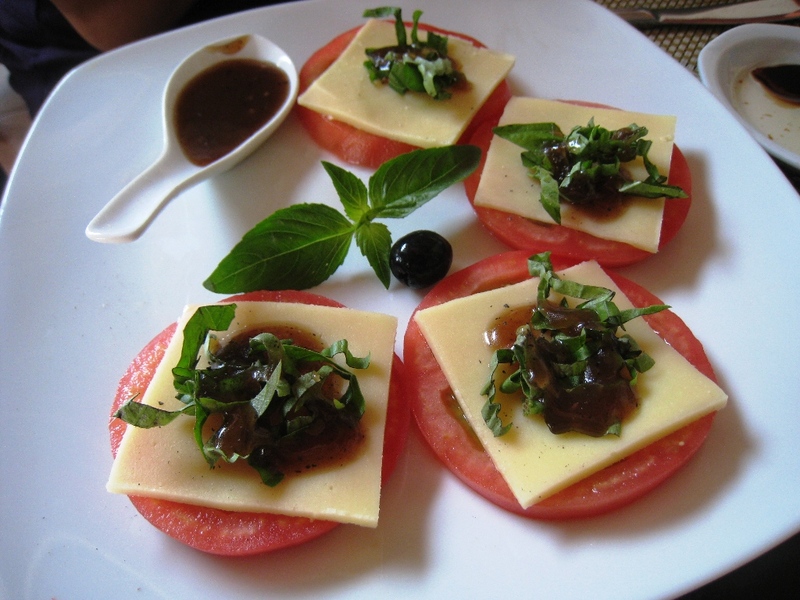 “Tapa” in this context loosely translates to strips of beef that had been cured. 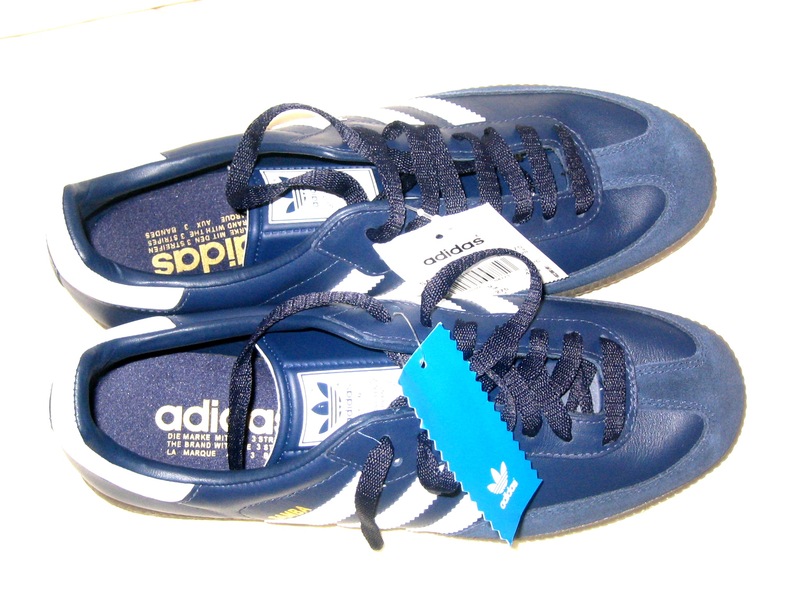 Adidas Samba shoes... my favorite! 1. My favorite shoes are still the Samba by Adidas. They’re the best! NATIONAL BROADSHEETS have hailed the Filipinos as the true heroes of the successful May 10 polls, our country’s first ever automated elections. I totally agree with them. But for examples worthy of emulation, I need not look far. One of my bestest friends, Friendship, exemplified to me the kind of patriotism our country needs in these times. 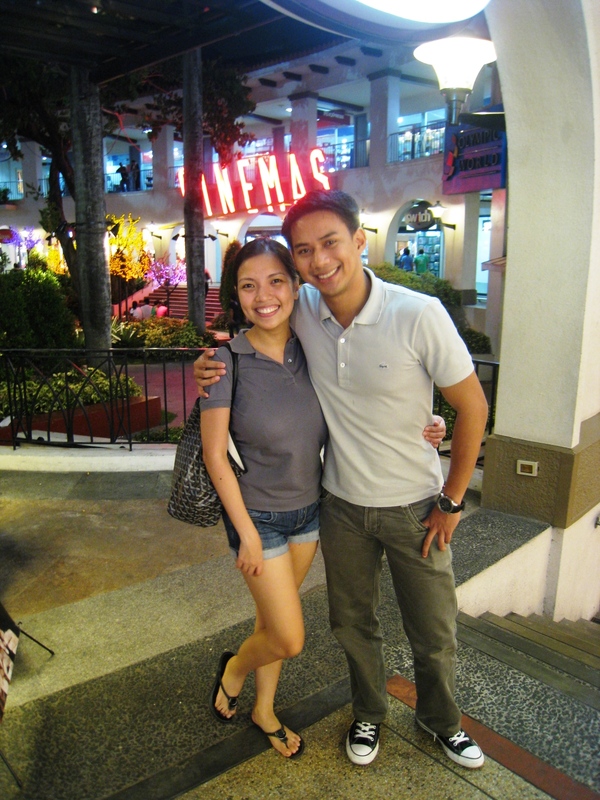 With Friendship, a "Bagong Bayani" (new hero) in the truest essence of the word. Friendship flew all of 1464.2 miles of air travel distance from Singapore where she is currently based, just so she could assert her right to vote and effect change in the national leadership. Yes, the Sunday before the elections was Mother’s Day, making her trip dual-purpose. But knowing Friendship, she would’ve surely taken a separate trip for the elections had it been far off. Her couple of days here were full-packed. And I’m quite thankful that she invited me over to lunch with her and her mom and sister. 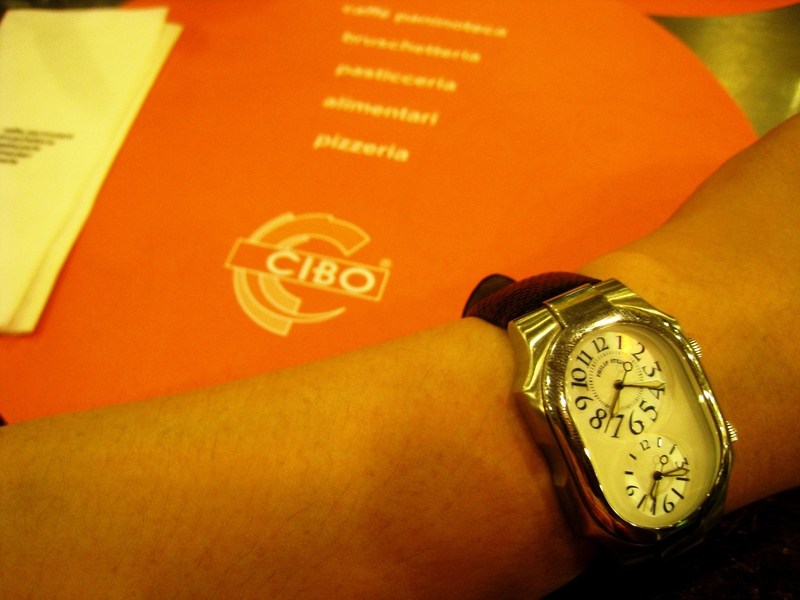 Restaurant of choice was one of our favorites, Cibo at Town. 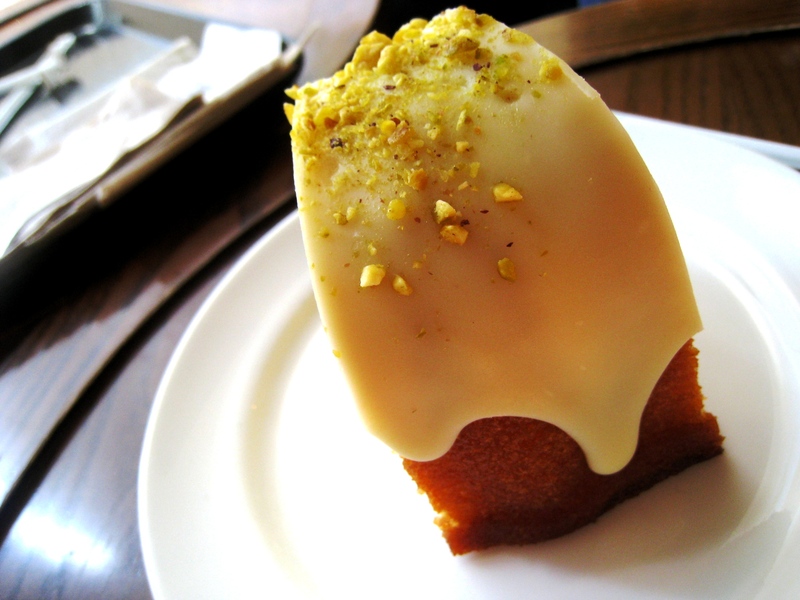 Dessert was at Starbucks. 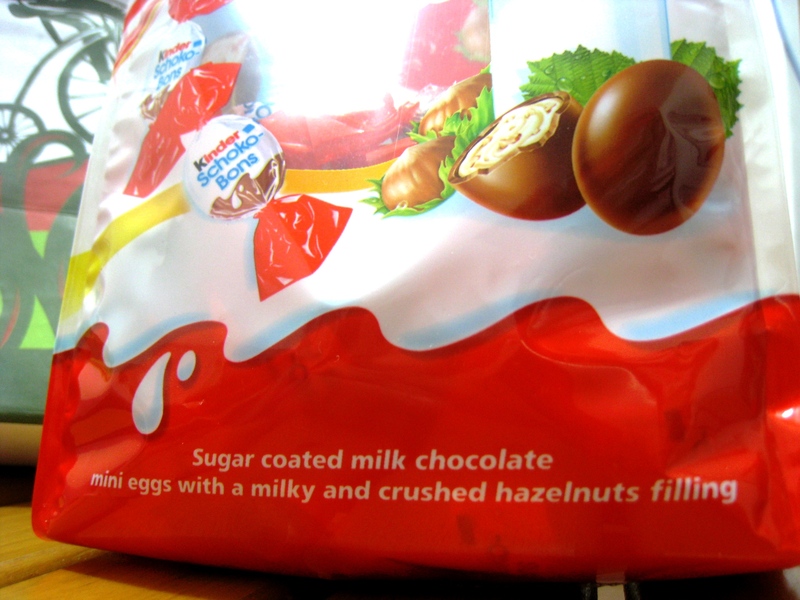 Of course, she had pasalubong for me! The next day, like a BMPM (“Boto Mo, I-Patrol Mo!”) correspondent, she kept me posted on how her voting experience turned out. After braving the long lines for at least a couple of hours, under the unforgiving heat of the summer sun, Friendship was on her way to the airport to catch her flight back. If that is not love of country, I don’t know what is. Thanks a lot, Friendship! Amishoo! 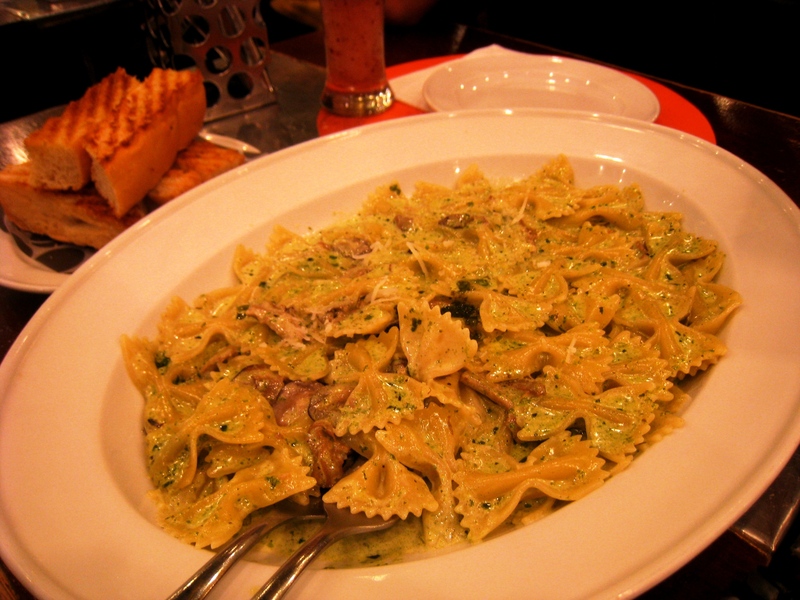 Friendship had "Farfalle alla Genovese" - farfalle (bowtie pasta) with mushrooms, basil pesto, and fresh cream. 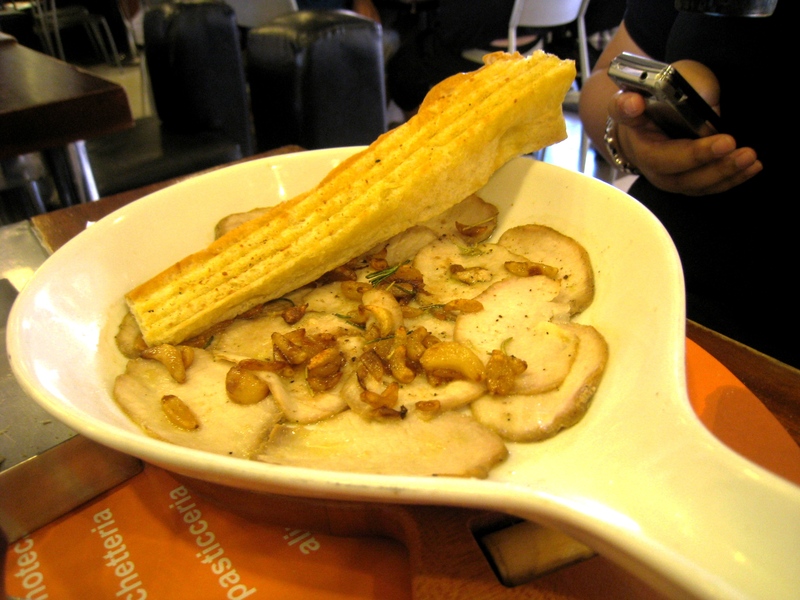 Friendship's sister had "Tagliata di Maiali" - slices of roasted pork tenderloin, with garlic and rosemary, and served with bread. 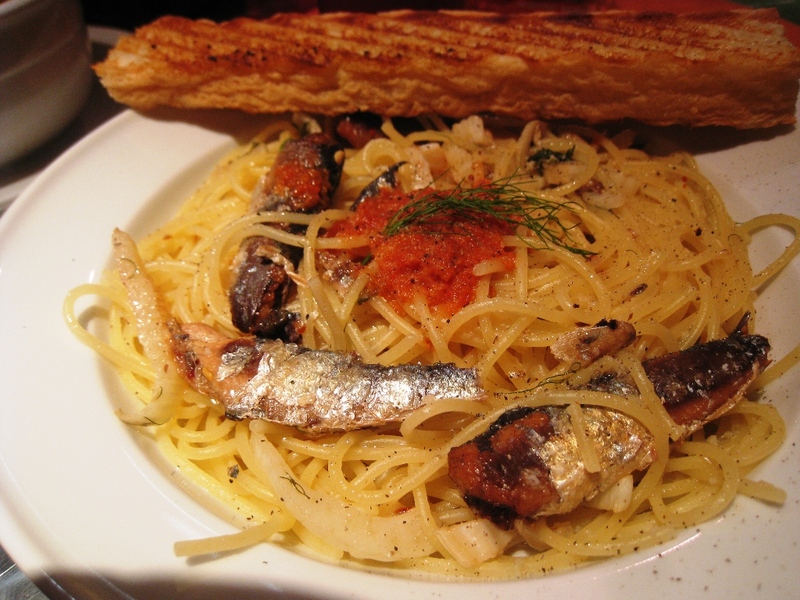 Friendship's mom had "Linguine alla Ghiotta" - linguine with mushrooms, bacon and cream! 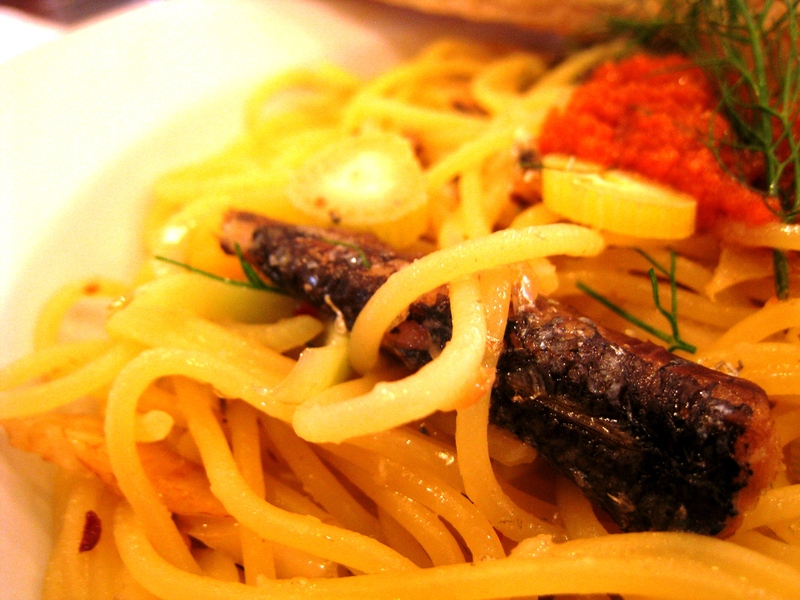 Of course I had my all-time favorite "Spaghetti Alla Romana" - spaghetti with sardines, extra virgin olive oil, fennel, chili peppers, and a dollop of red pesto. And, as printed on the receipt, I asked for "extra fennel please." 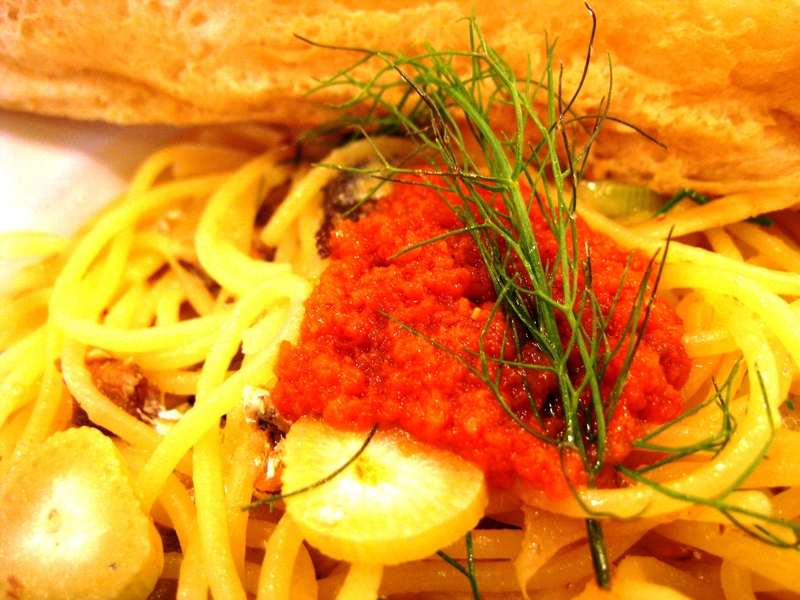 A pretty fennel frond sits atop the red pesto with every serving of this pasta dish! 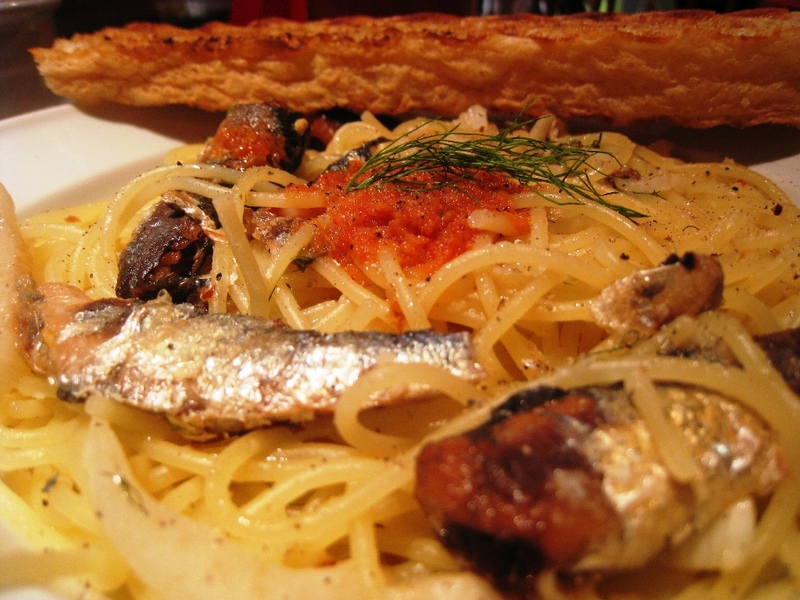 Just one sardine in a generous amount served with every order. 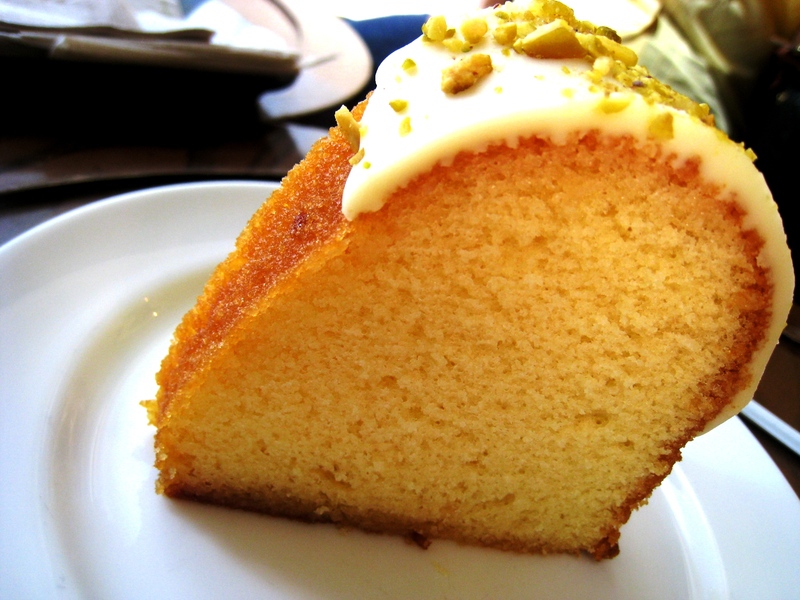 That's a pretty dense cake! 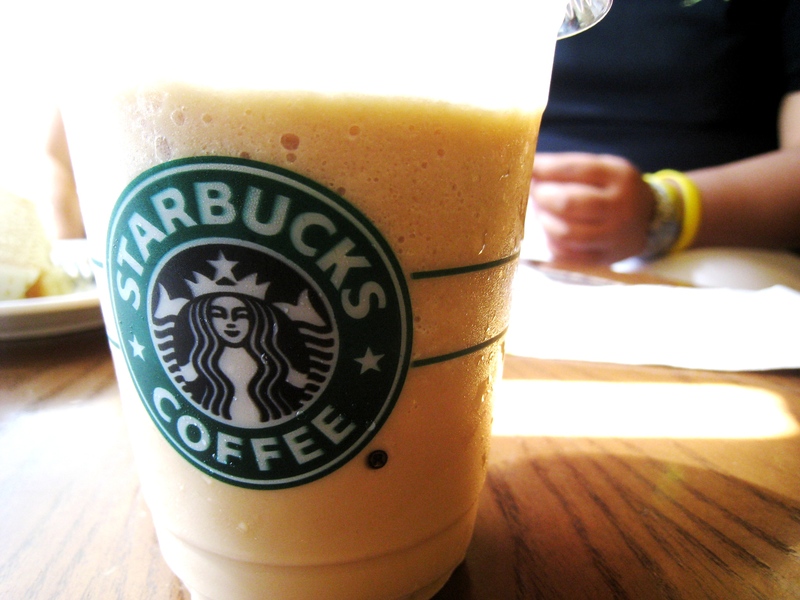 For the first time, I tried Friendship's sister's favorite caramel blended, no whipped cream drink. I loved it! 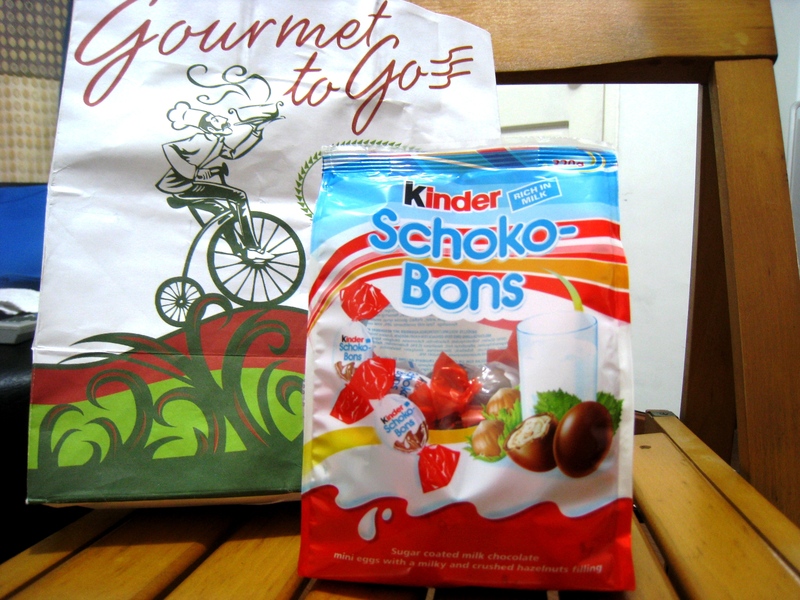 Goodies in a nice bag - Friendship's pasalubong! 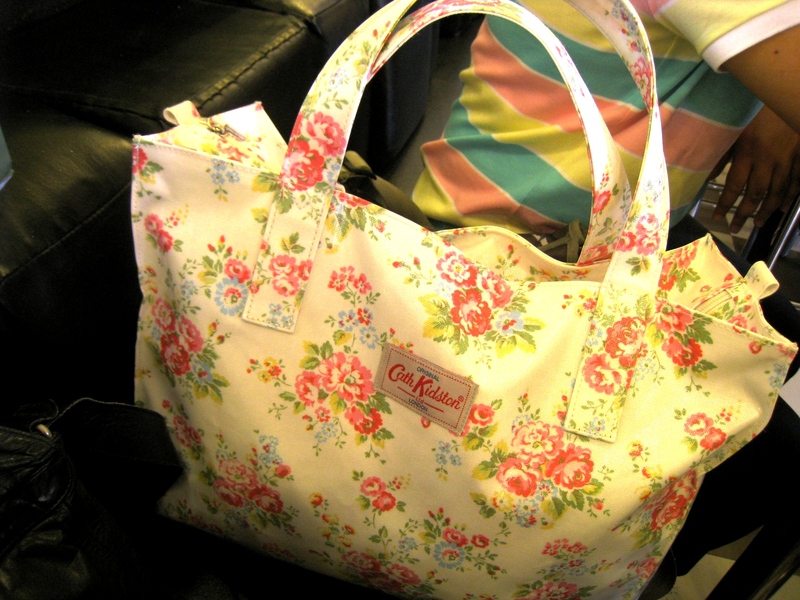 Friendship's sister was toting a Cath Kidston to lunch. She's only the second person I know who has this! 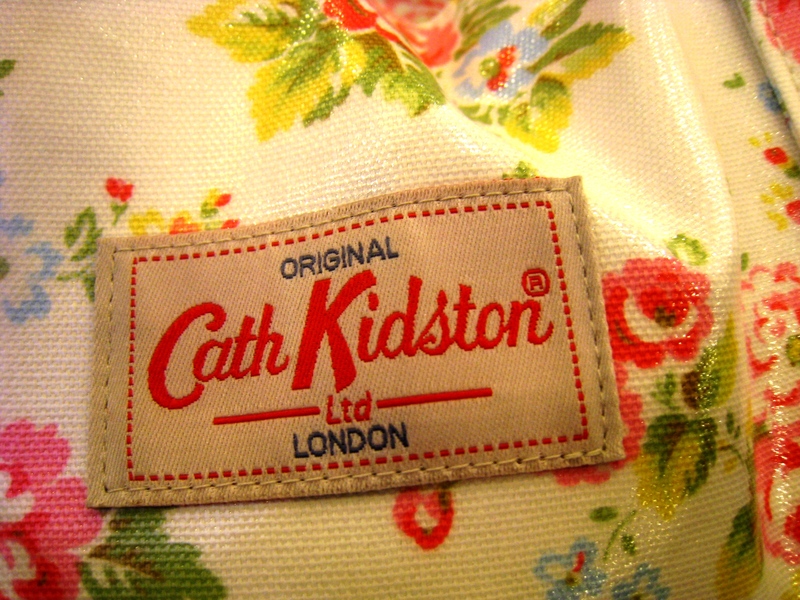 A closer look at Cath! Thanks Friendship - and Friendship's Mom & Sis - for yet another great lunch! I had a great time. Cibo at Shangri-La Plaza Mall has this beautiful all-stainless steel kitchen assembly, as if it is a work of art showcased front and center. Well, not really front, but attention-grabbing just the same. IT HAS been weeks since I didn’t have anything that has been supersized for dinner. I tell myself exactly that whenever I feel the need to justify splurging on meals out. Which, come to think of it, shouldn’t be the case as food is – as I have said time and again – both a necessity and an indulgence. Therein lies the perfect excuse. And after long walks in the mall, my feeling esurient and parched were reasons enough to grab something to bite. Something really nice to bite. 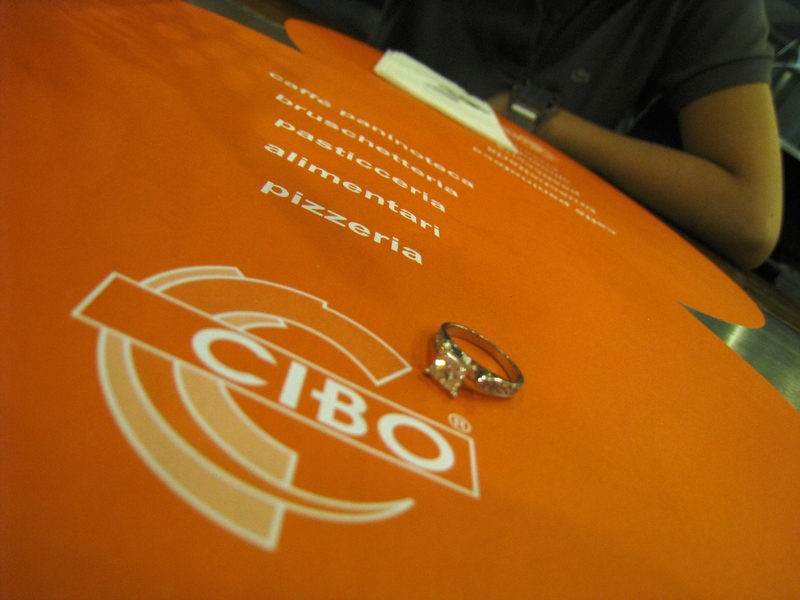 At the Shangri-La Plaza Mall over the weekend, I got particularly drawn to the open space occupied by Cibo. Going down the escalator, my attention was demanded and undoubtedly captivated by the very compact, all stainless steel structure that the café put up to house its kitchen setup. How such a closely clumped construction manages to churn out amazing works of edible art is beyond me. But one thing is for sure, in the hands of a lesser mortal – a MUCH lesser mortal – Cibo wouldn’t be able to maximize the potential of such a pretty kitchen to produce great, high quality food… fast. We all have the Margarita Araneta Fores to thank for that. 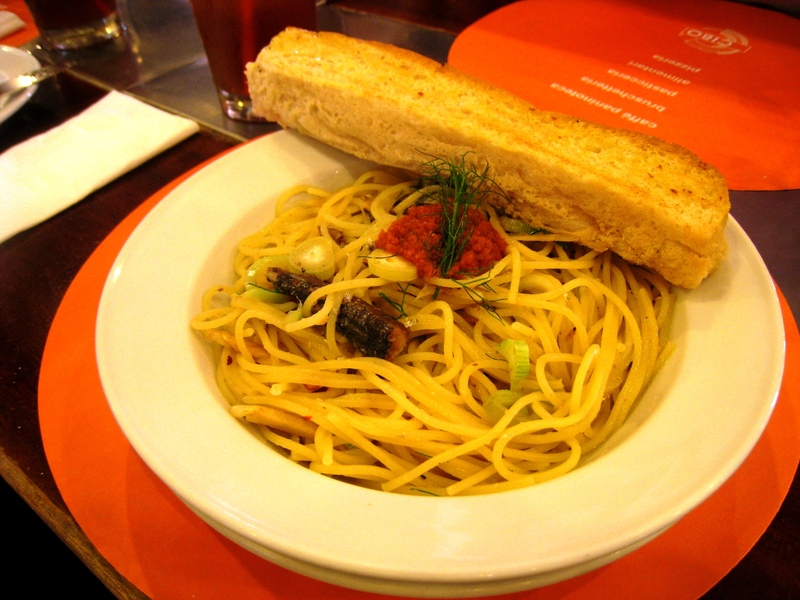 I asked for my usuals – the Spaghetti Alla Romana and Tomato Juice. And for the first time, I tried their Ministrone. 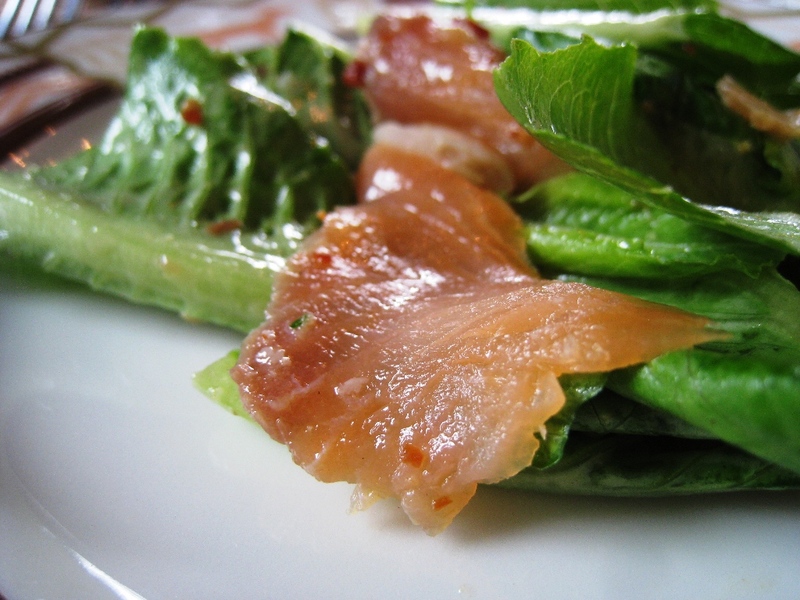 I found it to be really subtle – but bursting with the real goodness of fresh vegetables! Unlike in other restaurants, Cibo’s version was topped off with a dollop of fresh pesto genovese and lots of torn fresh basil leaves! I cracked a few turns of the pepper mill and the whiff of the really fragrant crushed peppercorns not only dotted the soup prettily but also made the flavors more robust. 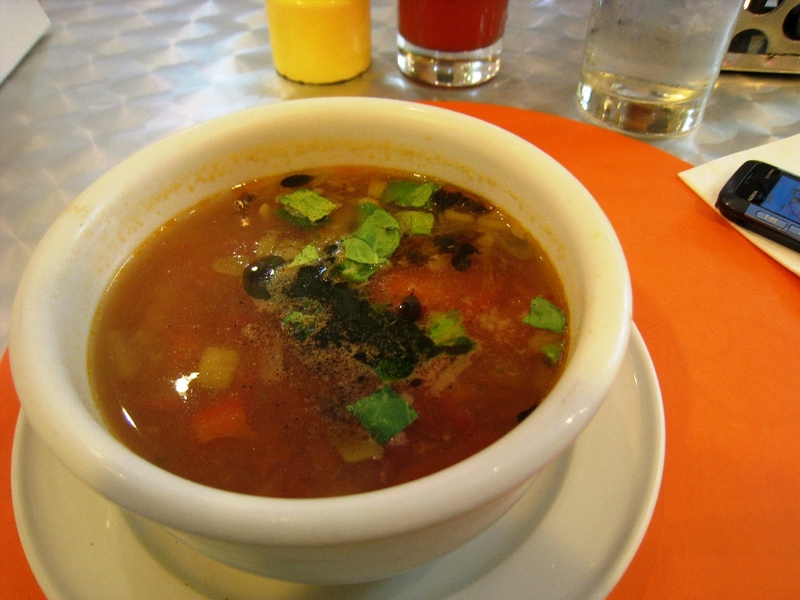 I could have this soup all day! 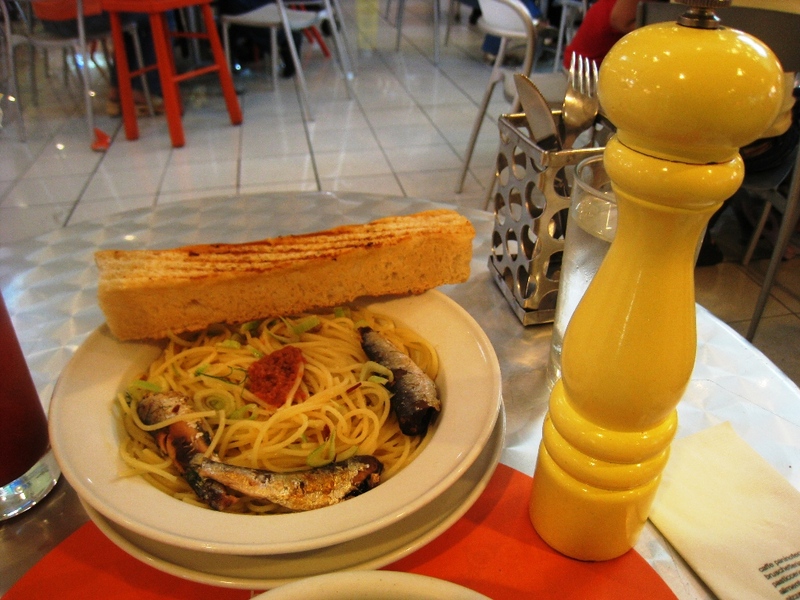 Spaghetti Alla Romana, together with one of Cibo's pretty pepper mills. I super loved this yellow one! 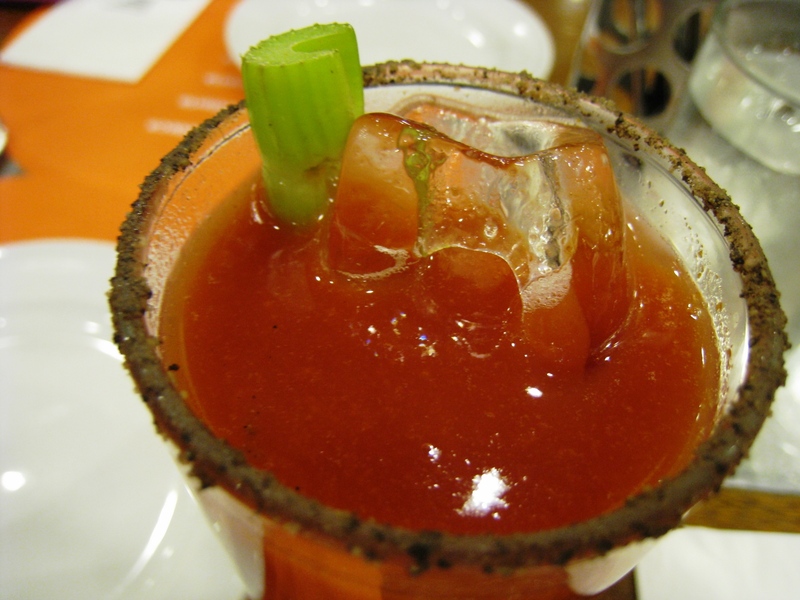 My Tomato Juice always gets a few cracks of fresh black pepper. 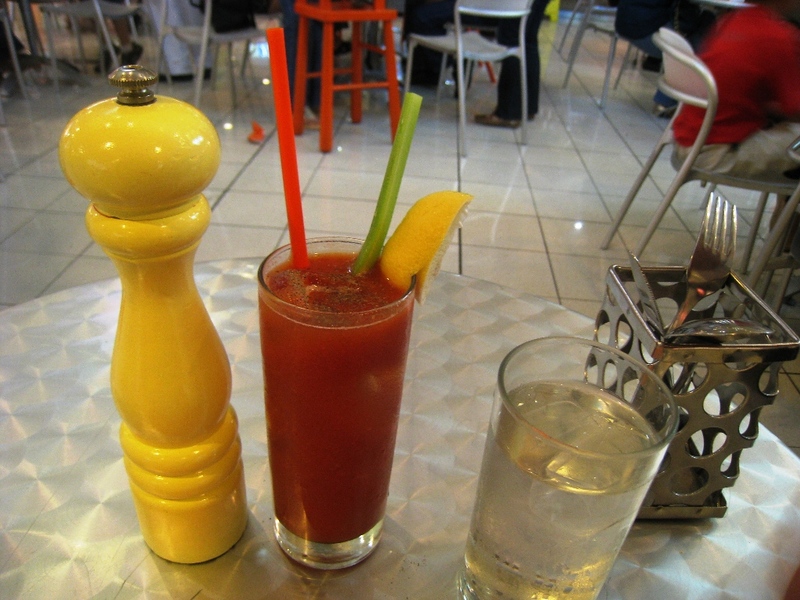 This time, it came coustesy of this yellow pepper mill. Not bad for an extremely satisfying table for one! As always, the pasta didn’t disappoint. The slivers of fennel bulb were plentiful as the kitchen obliged to my request for a little extra of these pleasantly fragrant, licorice-tasting aromatic bulbous herb. Copyright © 2010 by eNTeNG c”,)™©’s MuchTime™©. All rights reserved. SATURDAY TURNED out to be all about loving myself. 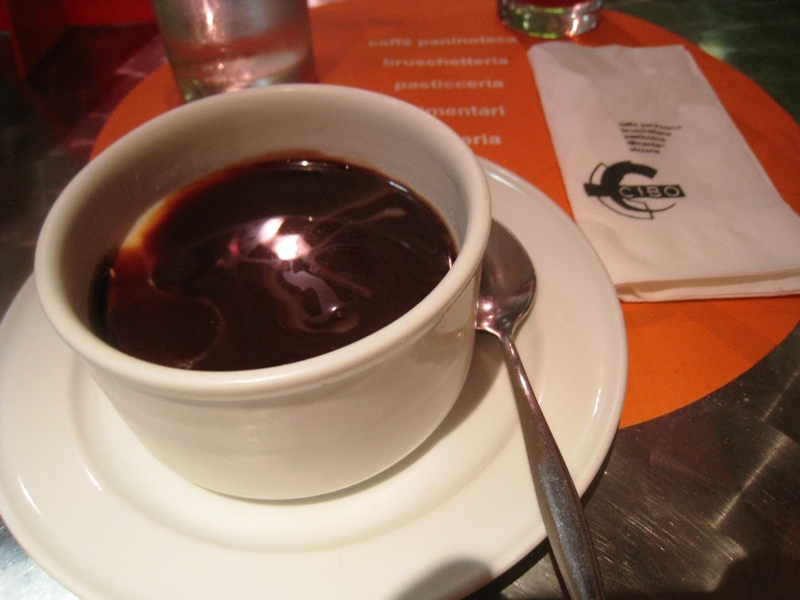 For one, I made good on my promise to treat myself to Cibo’s Panna Cotta Ciccolato (Php 143.00). But that’s getting ahead of myself. 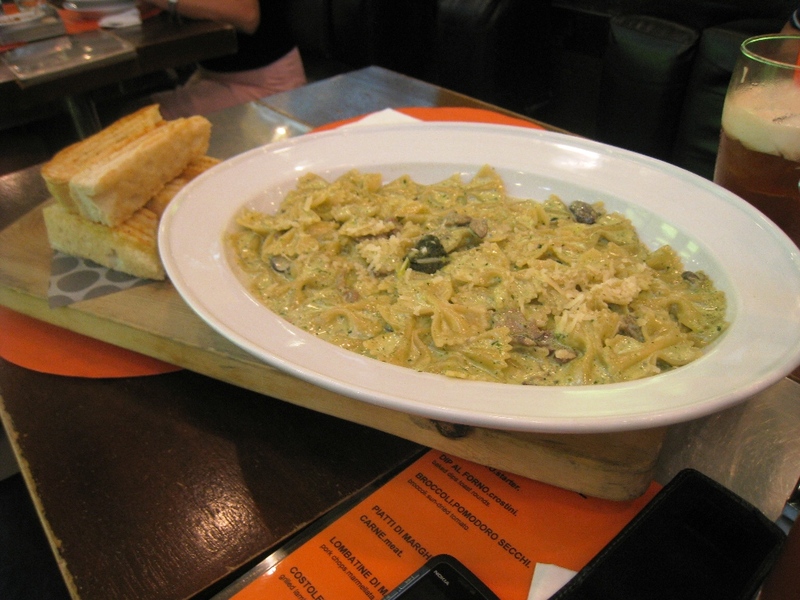 My table for one at Cibo in Glorietta. 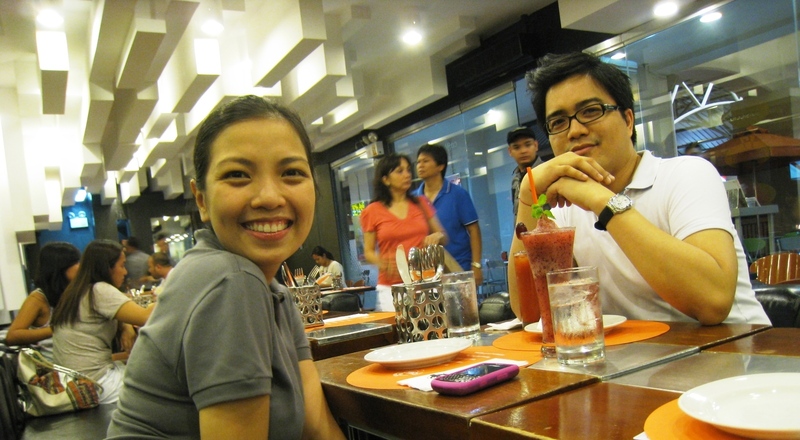 The night before, I had a great dinner with Kakel at Cibo in Town. 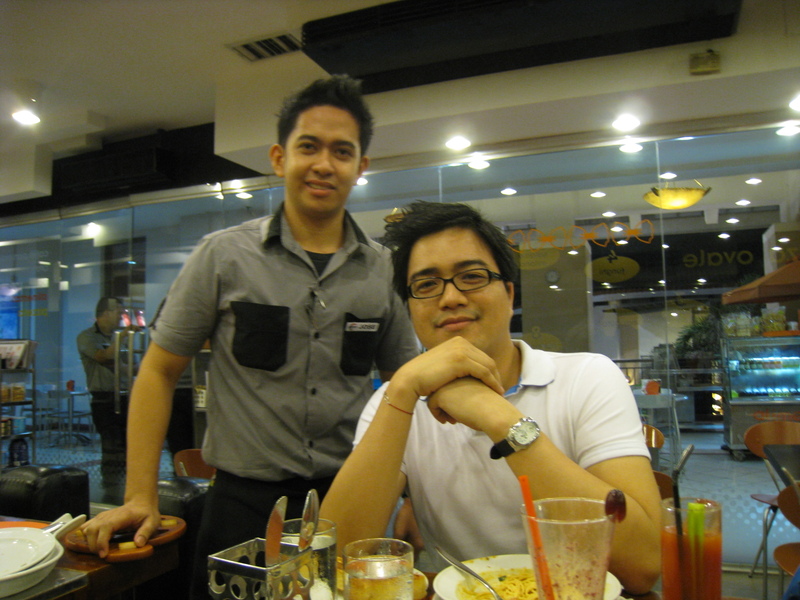 On Saturday night, I went back to the same restaurant, but at their Glorietta branch. While I enjoy being in the company of family and friends over good food, I don’t have even the faintest hint of hesitation – even an iota of indecision – to dine on my own. 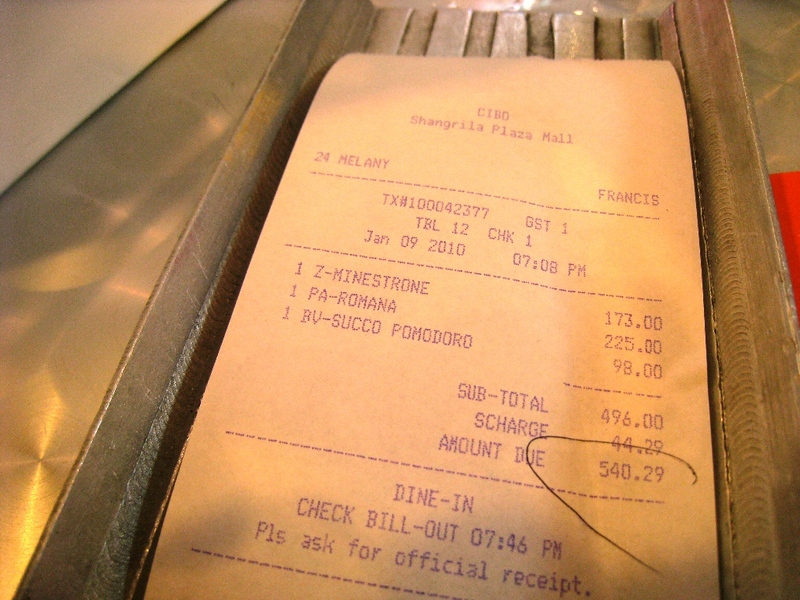 When the very comely wait staff welcomed me by saying, “Sir, table for…” I cut him short with, “For one, please,” before he could even finish his question. It wasn’t a curt reply at all. I do remember beaming from ear to ear. 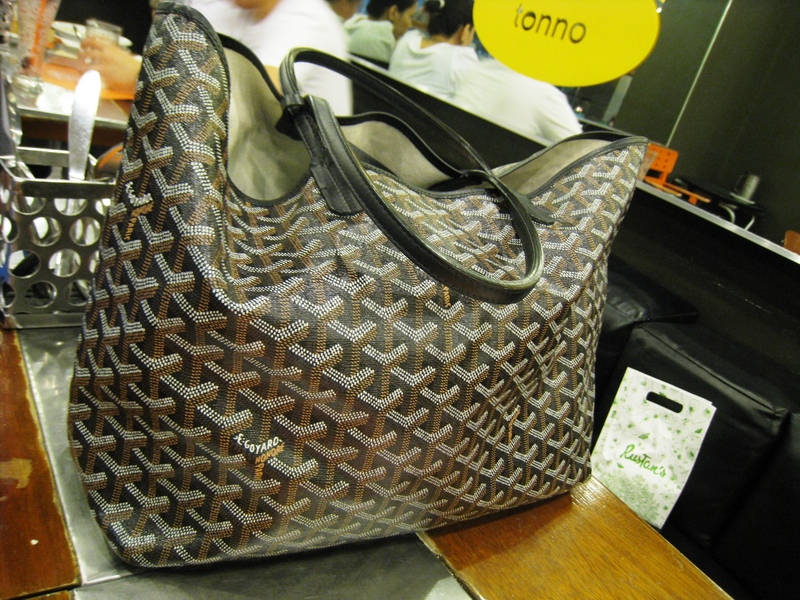 Especially since I was already toting in my hand my Christmas present for myself. Hahaha! This particular dinner was all about comfort so I asked for my usuals – the zuppe di Crema Di Zucca (soup of summer squash, cream, and slab bacon, Php 185.00), the Spaghetti Alla Romana (spaghetti with sardines in oil, extra virgin olive oil, fennel, chili peppers, and red pesto, Php 225.00), and the Panna Cotta Ciccolato. 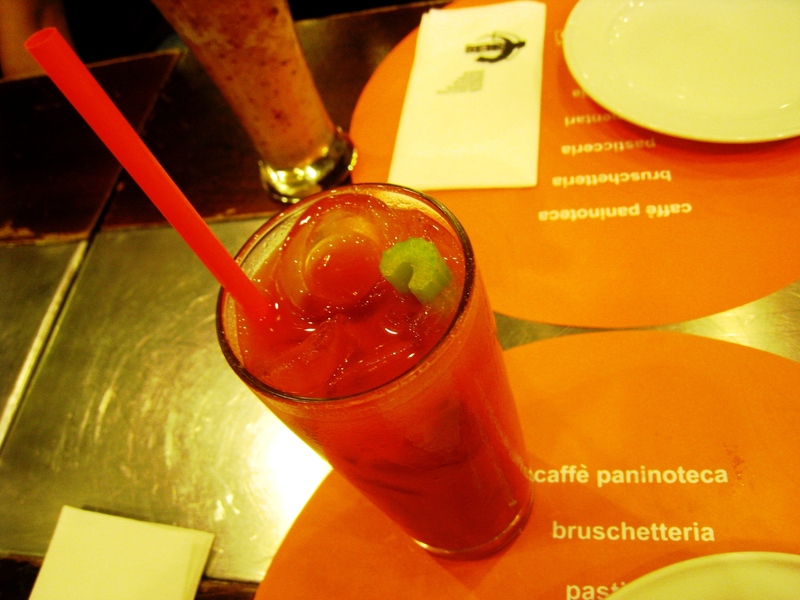 Of course, my drink could only be Tomato Juice (Php 90.00). 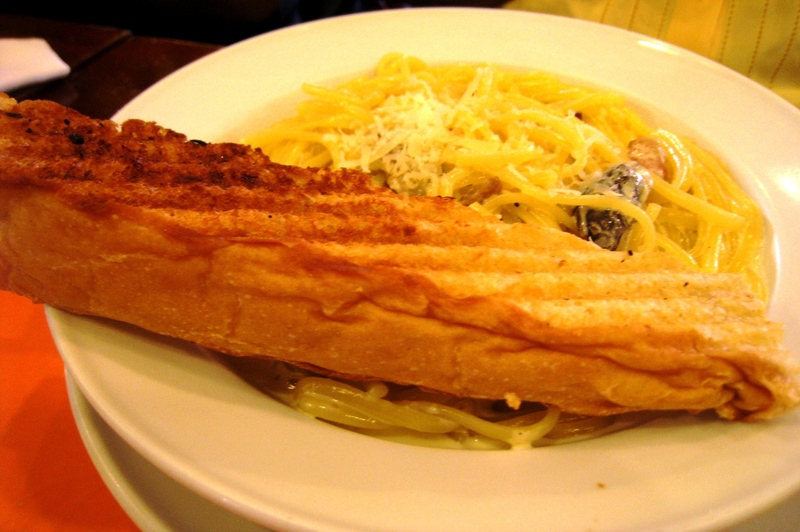 Spaghetti Alla Romana, my favorite! That fennel frond on top was just so tempting I munched it first! The sardines were perfect, a far cry from the usual bottled variety at the grocery (though there's one brand I hold dear!). And the shredded fennel bulb was just the right sweetness! The star of this dinner was the pasta, to which the kitchen generously added extra fennel. I was so excited to get my fork into the dish but not without first snatching the fennel frond that prettily sat on top of the mound. As I played with it in my mouth, shredding the pin-like succulent foliage with my teeth, I got an arresting shot of an almost-licorice essence. It was all good. 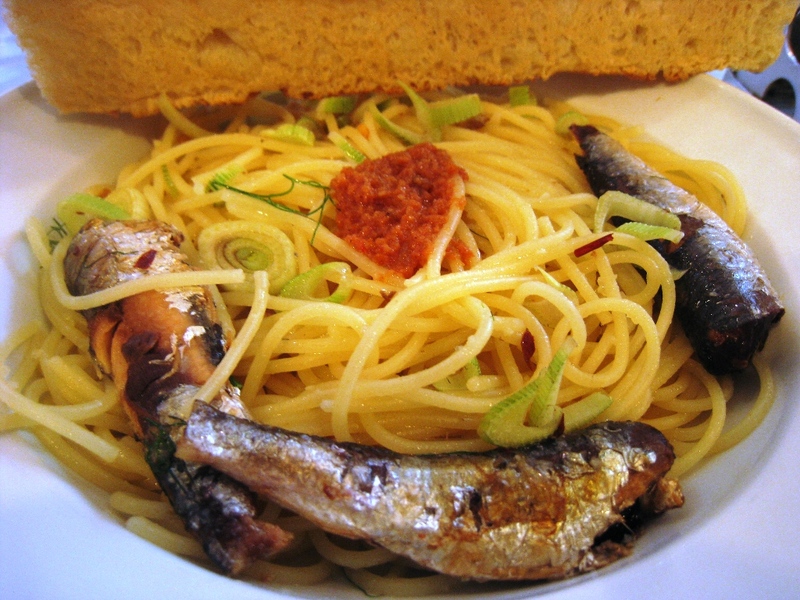 Each strand of the al dente spaghetti was perfectly coated with the glorious melding of extra virgin olive oil and the oil in which the sardines marinated. The chili peppers and the red pesto provided a pow-wow layer of heat that developed as I savored the dish. 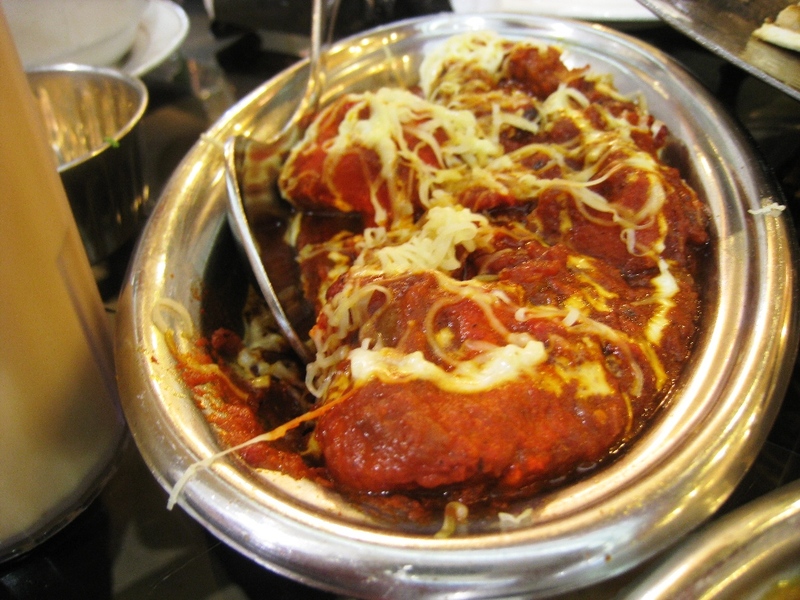 But the shredded fennel bulb – the white part – provided the perfect counterfoil to this spiciness. I couldn’t think of anybody else delivering such a great pasta creation for the discriminating Filipino palate. I started harping about panna cotta ciccolato and ended up raving about the pasta. Oh, life! The Panna Cotta Ciccolato that I love! 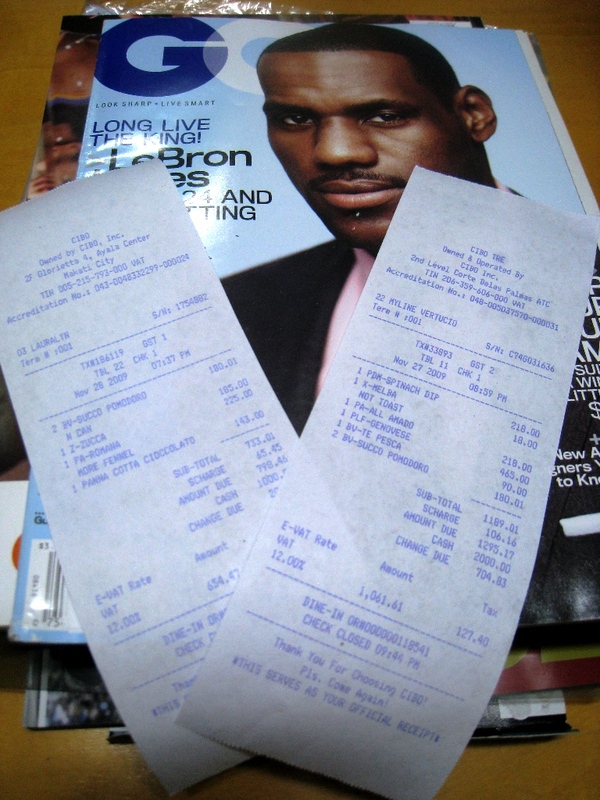 Two receipts from two wonderful dinners! 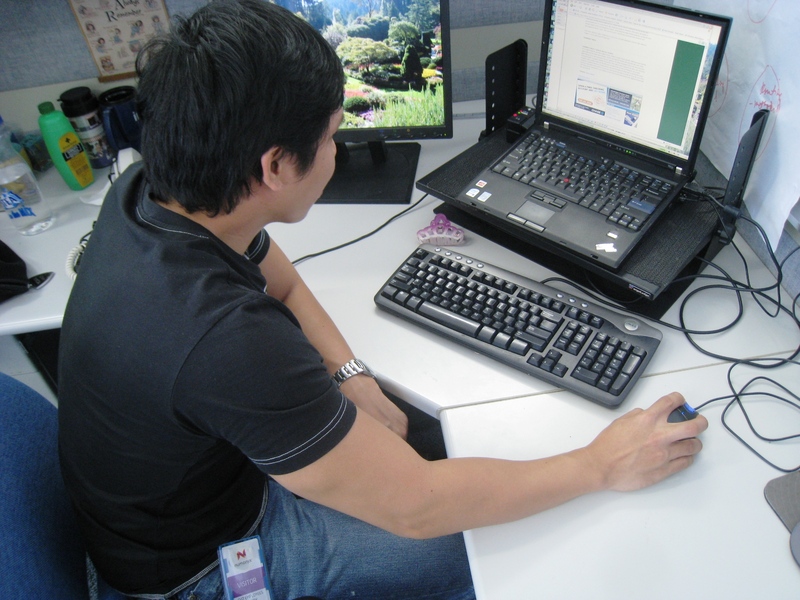 Copyright © 2009 by eNTeNG c”,)™©’s MuchTime™©. All rights reserved.